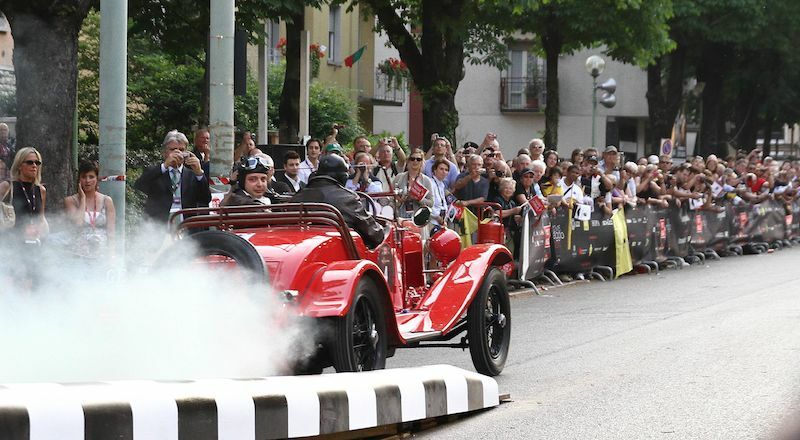 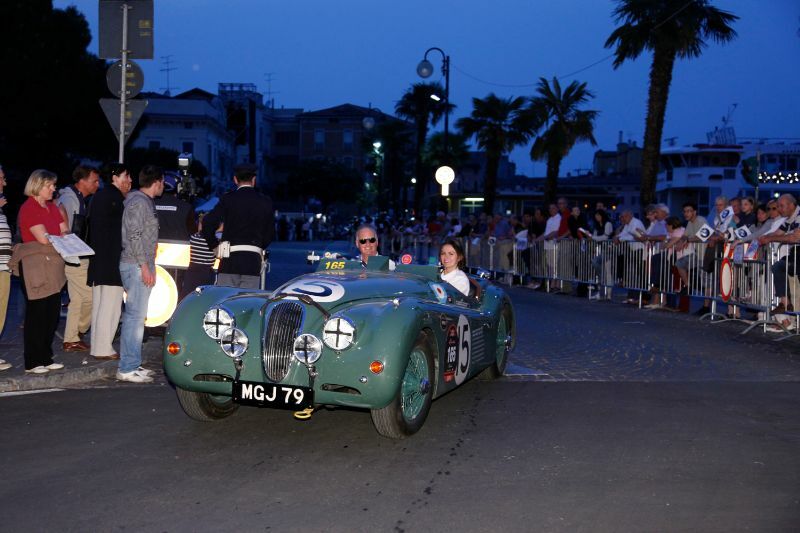 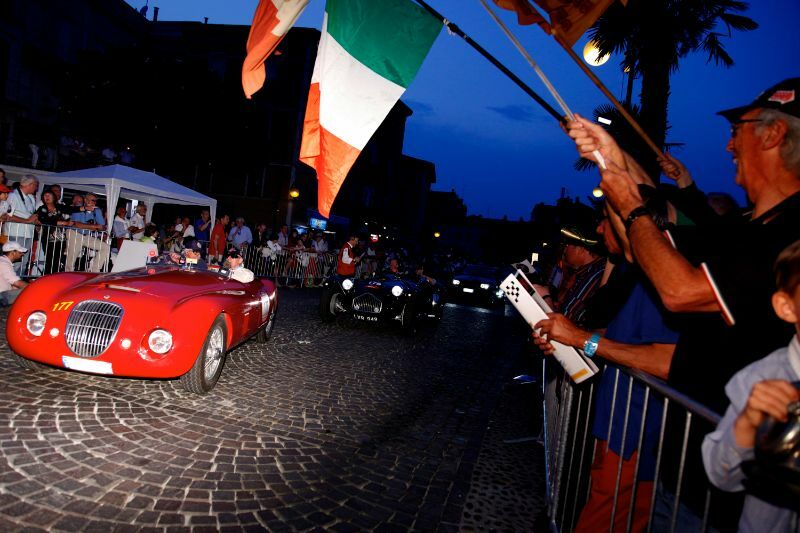 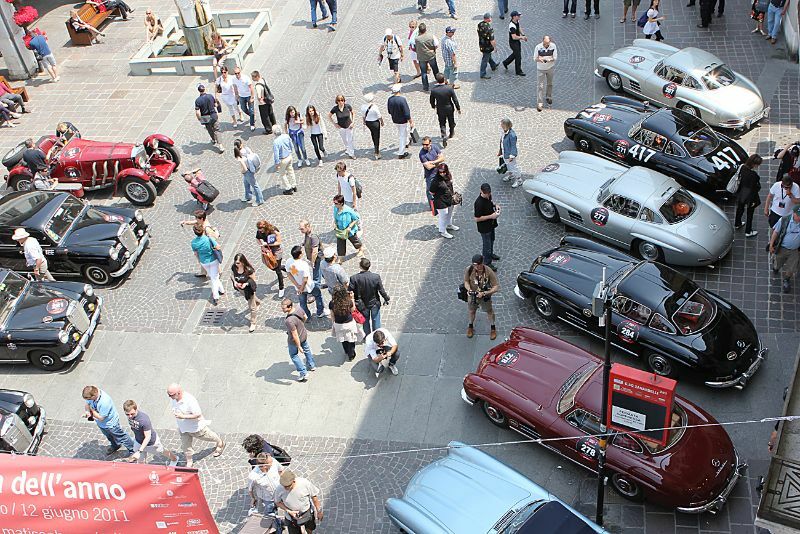 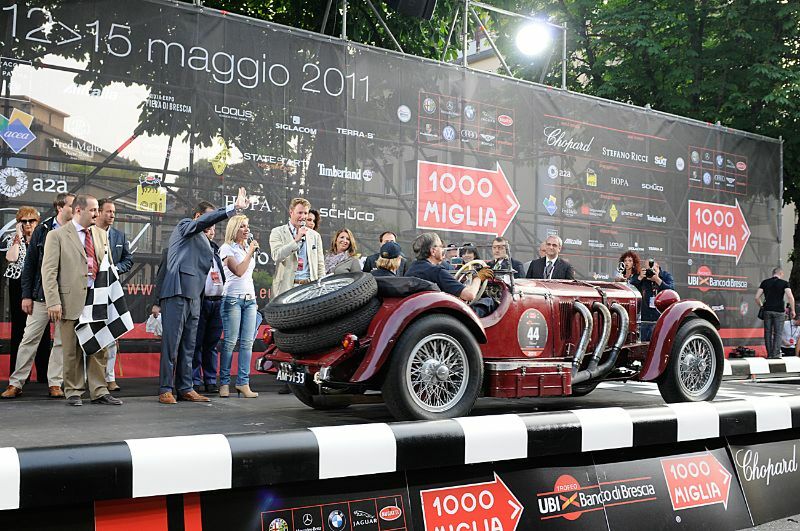 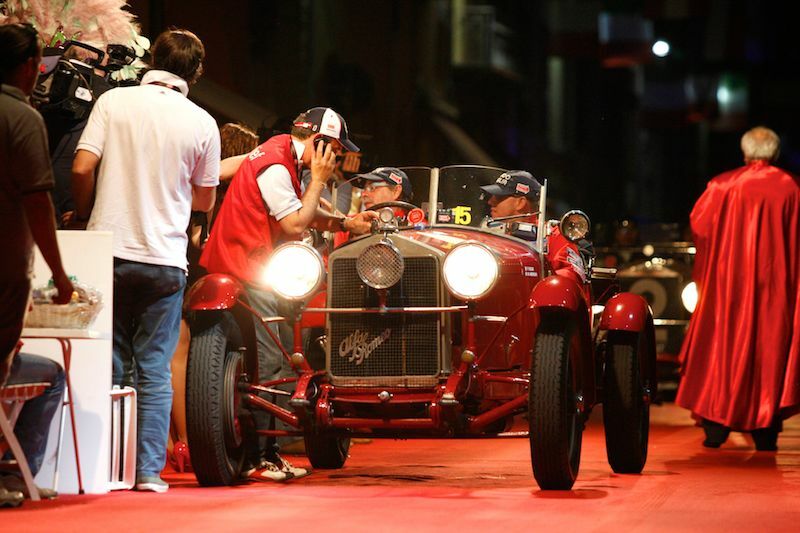 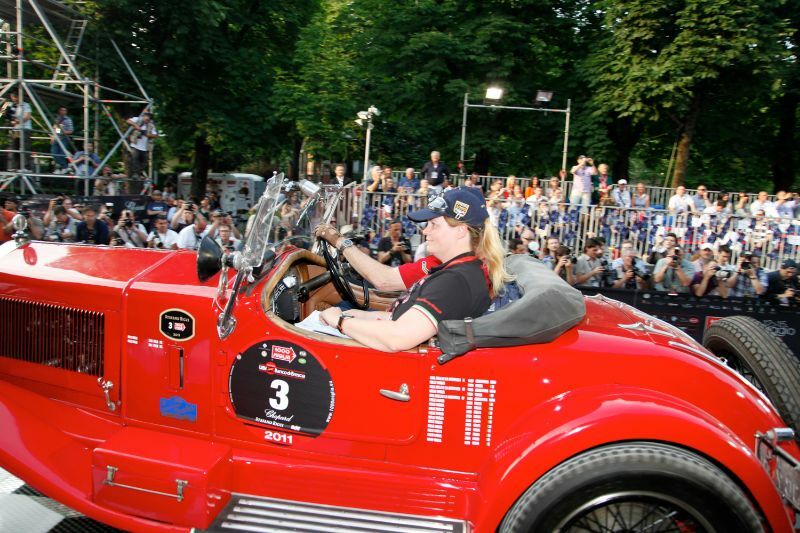 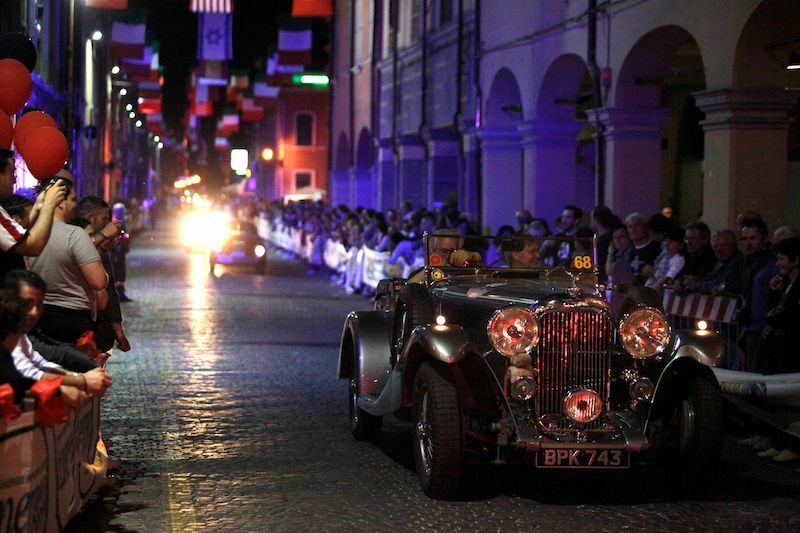 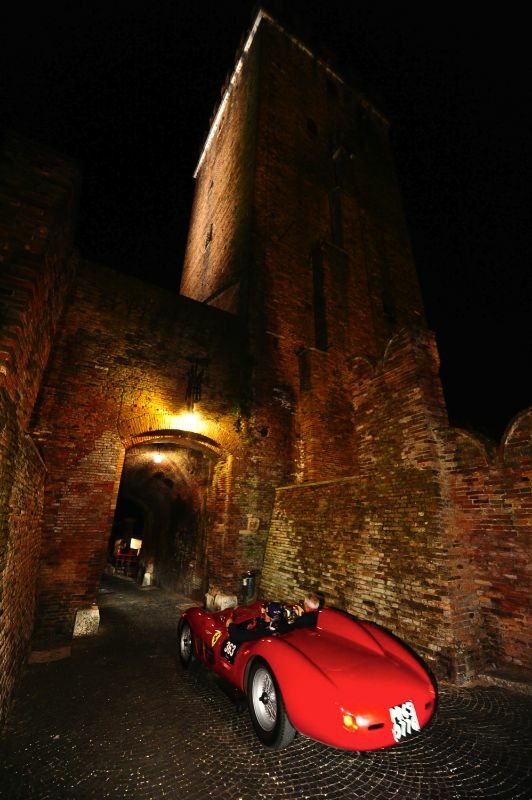 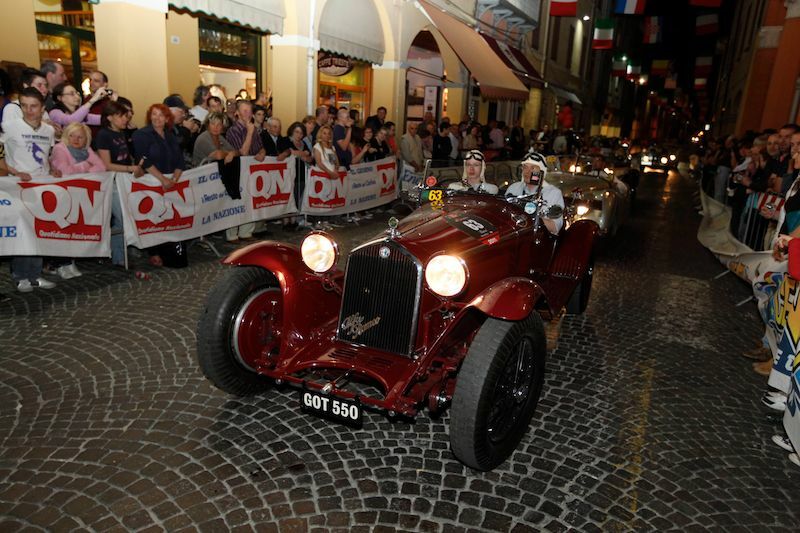 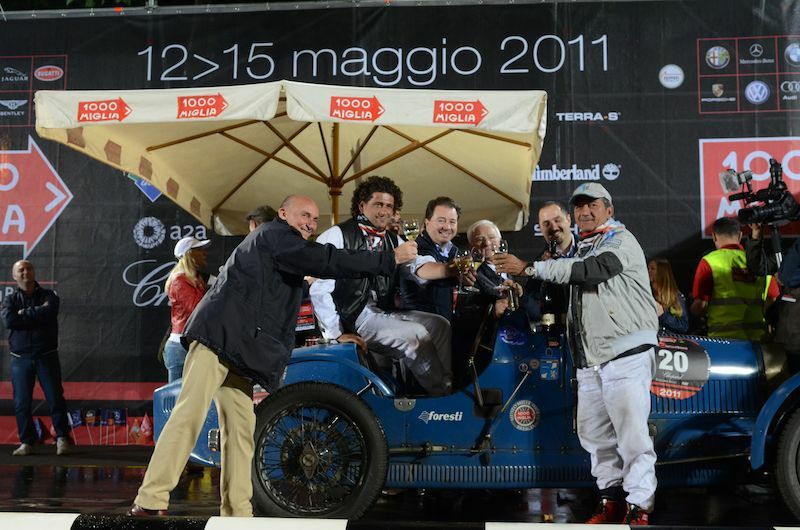 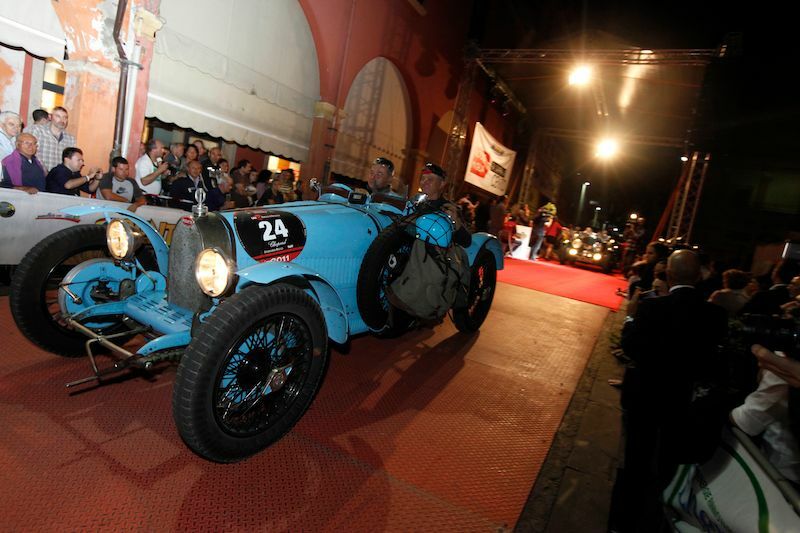 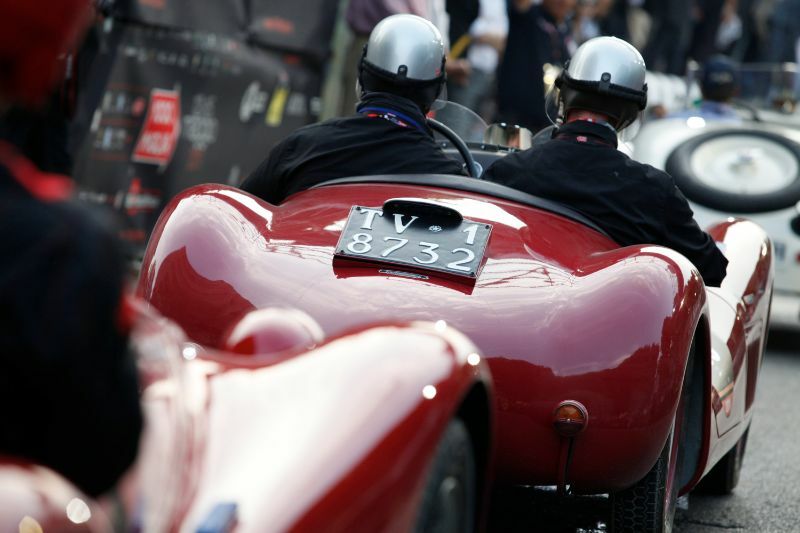 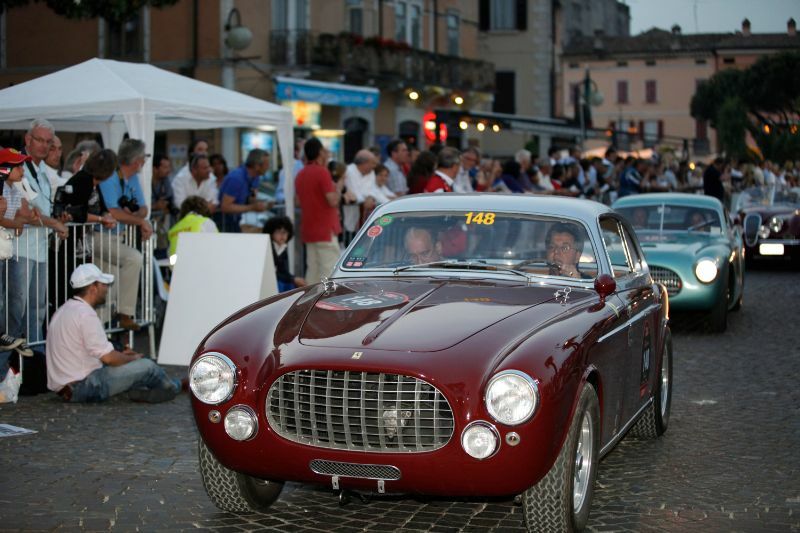 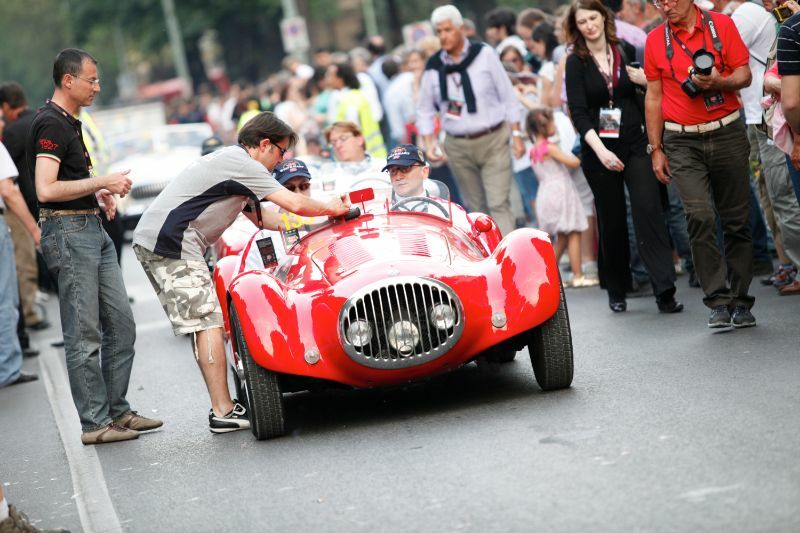 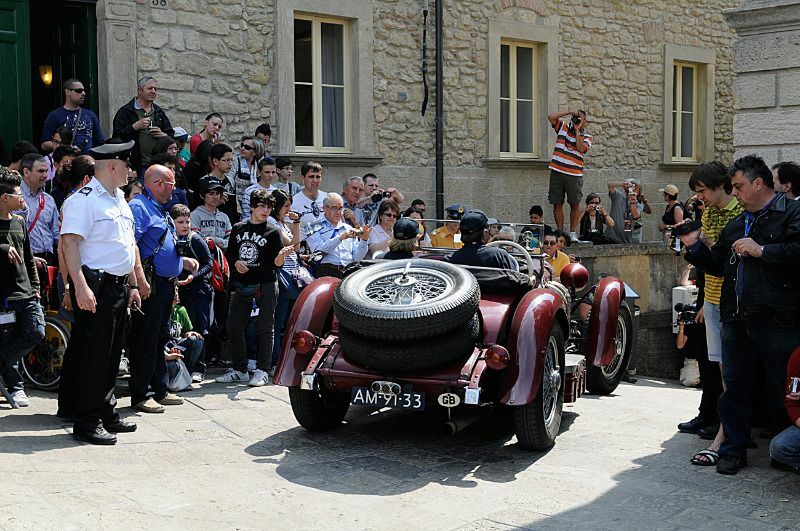 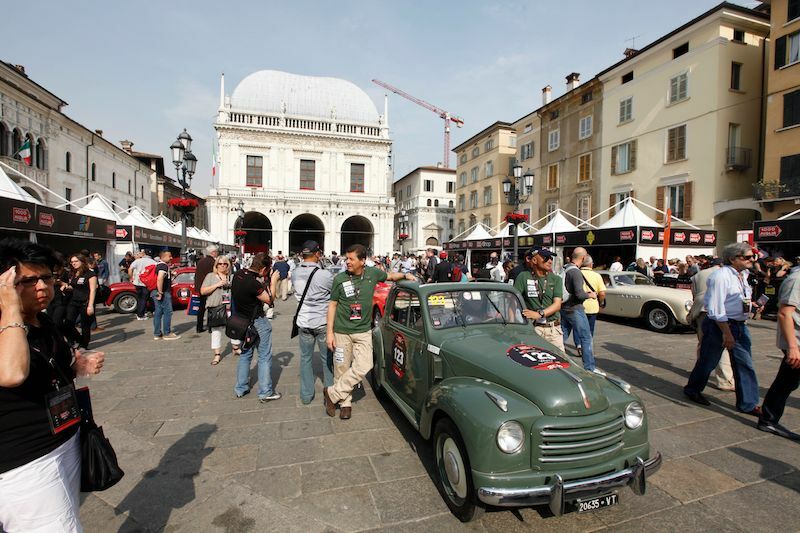 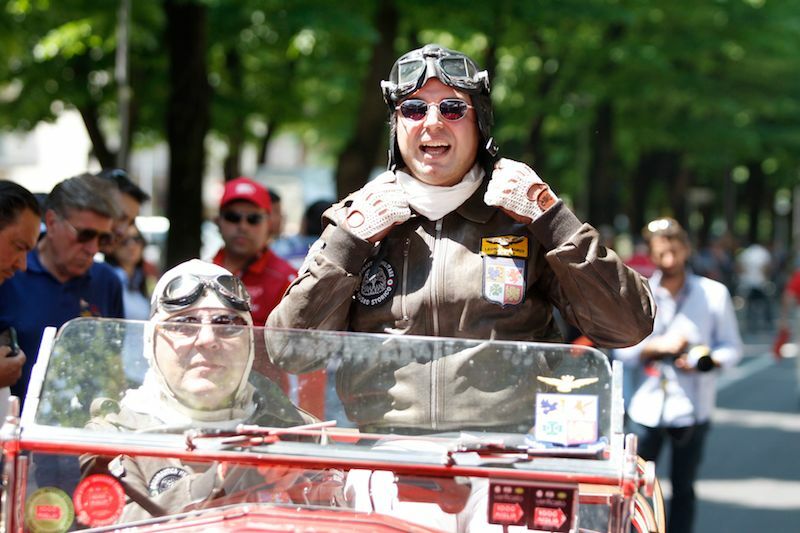 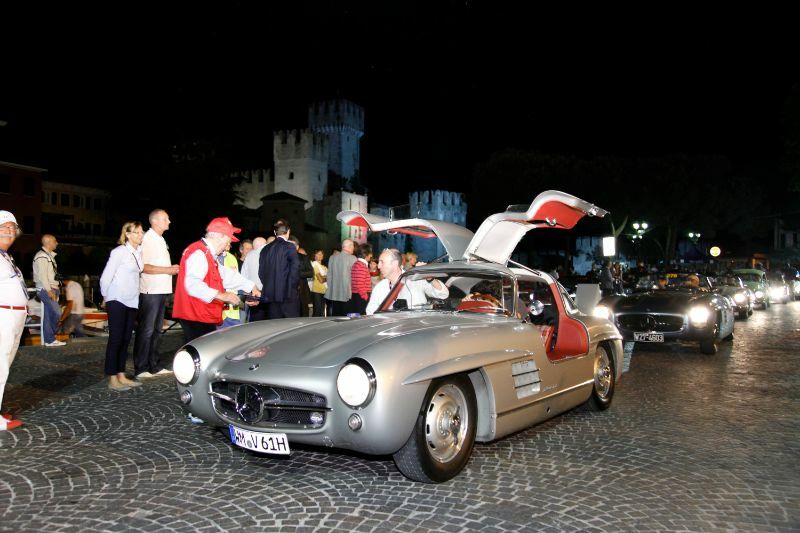 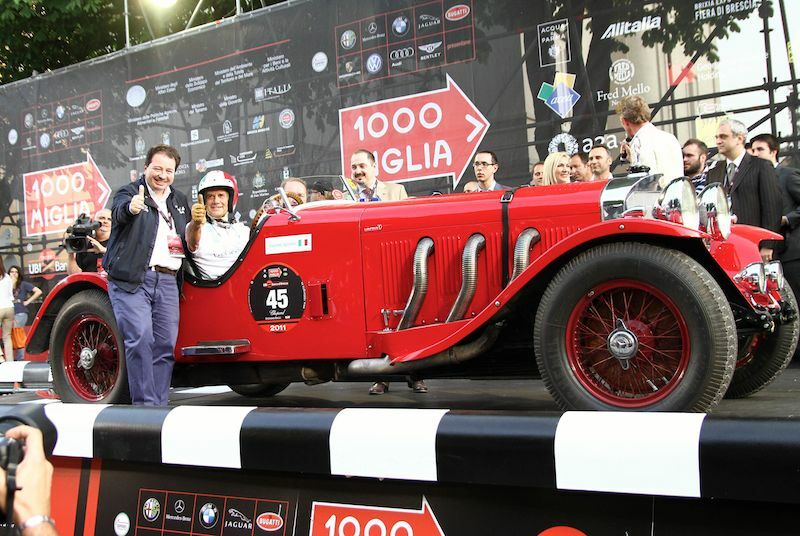 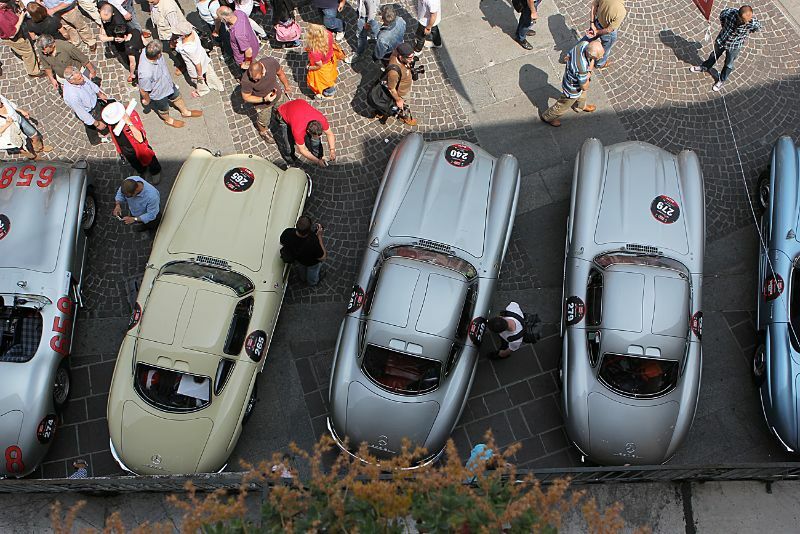 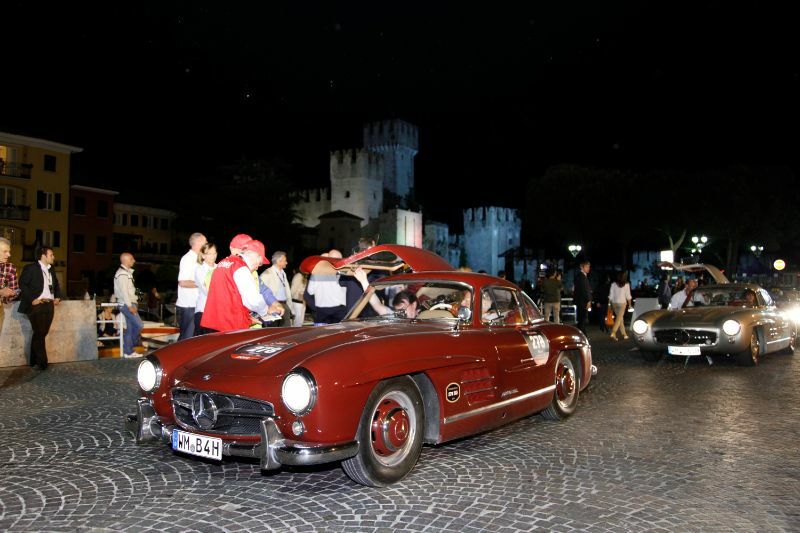 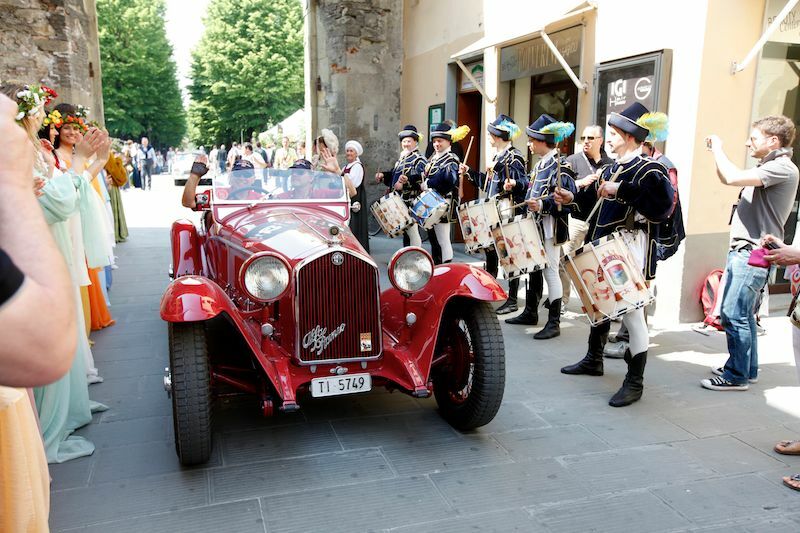 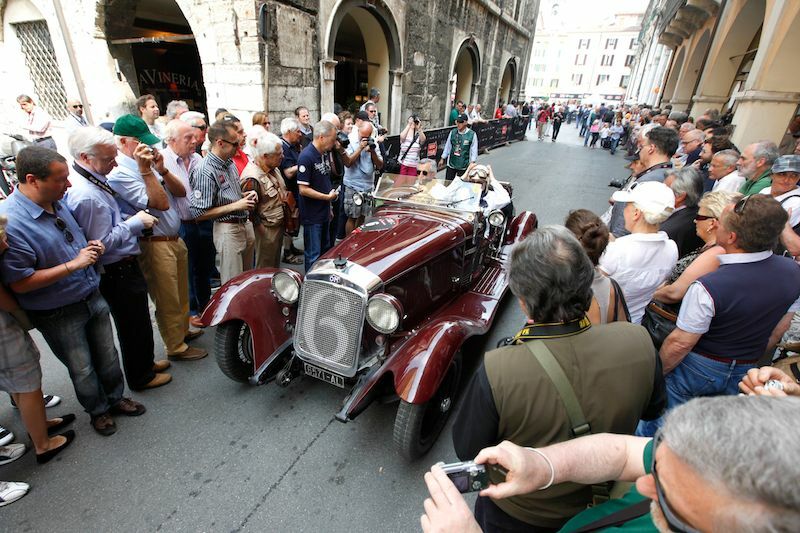 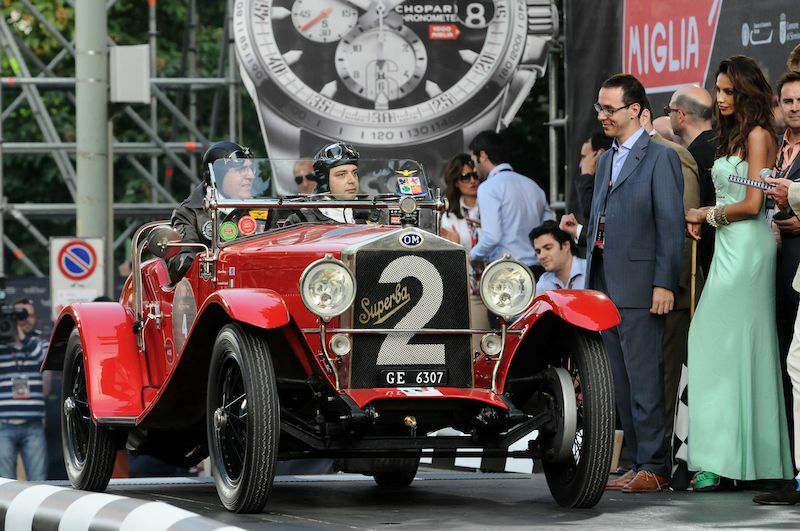 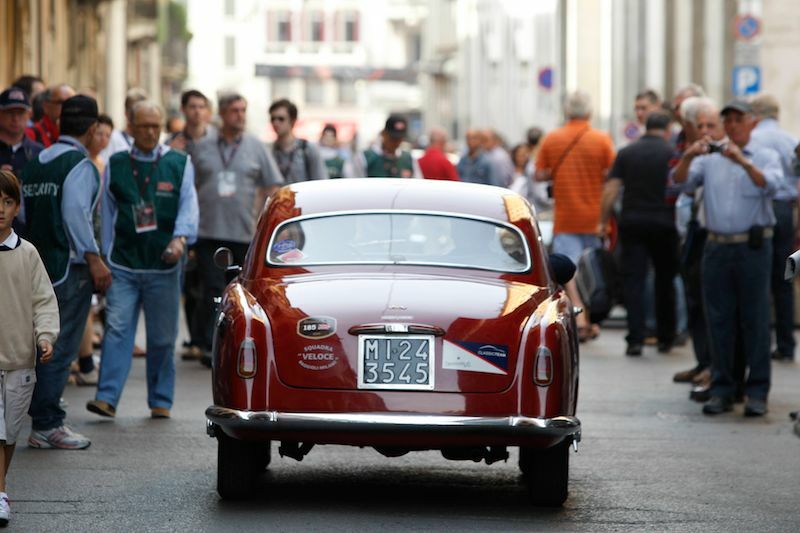 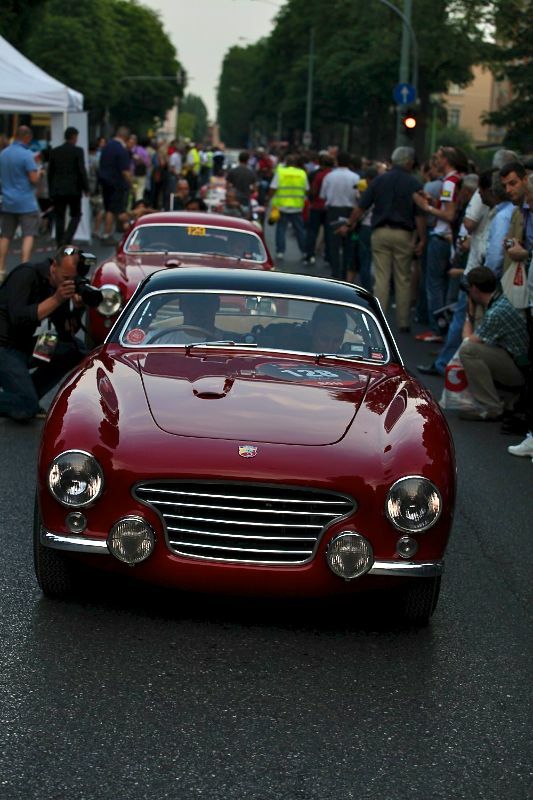 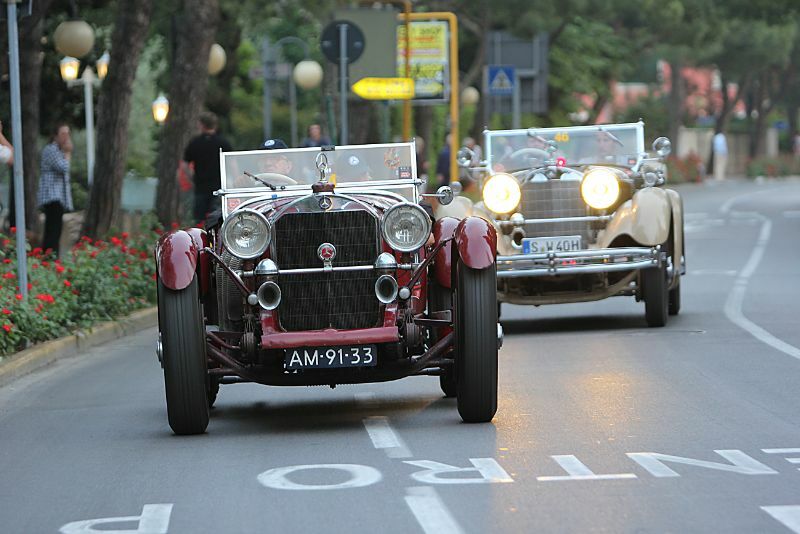 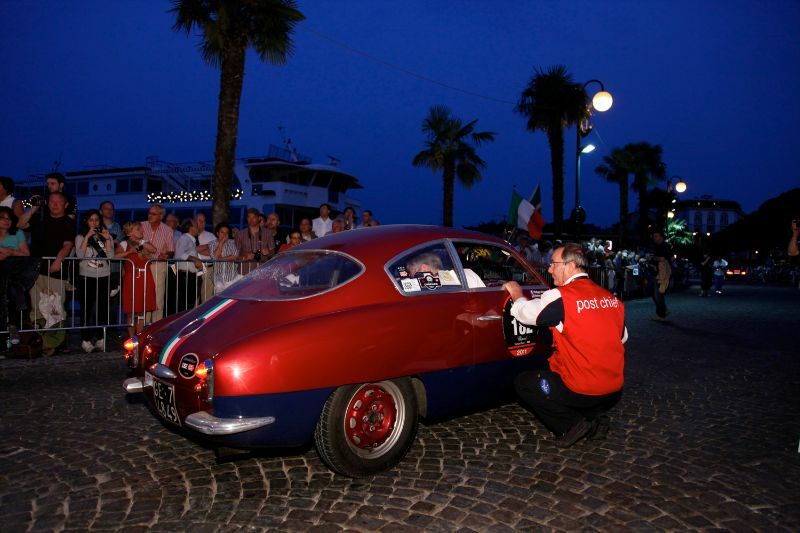 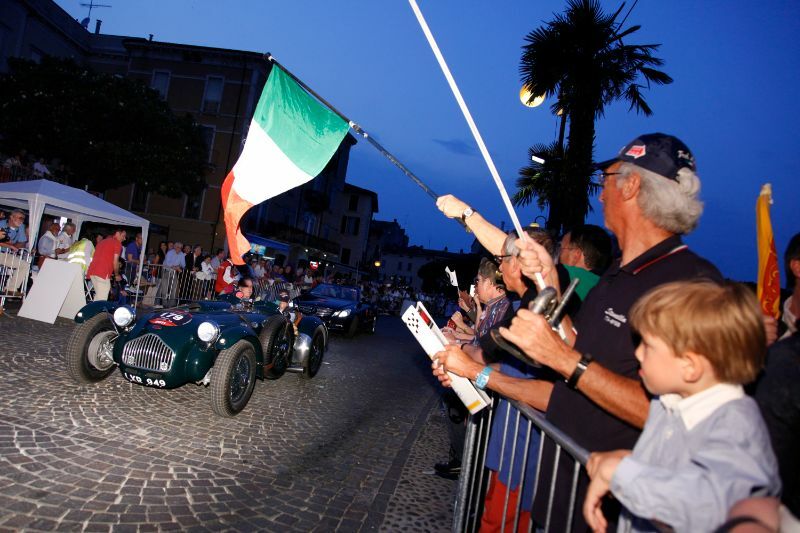 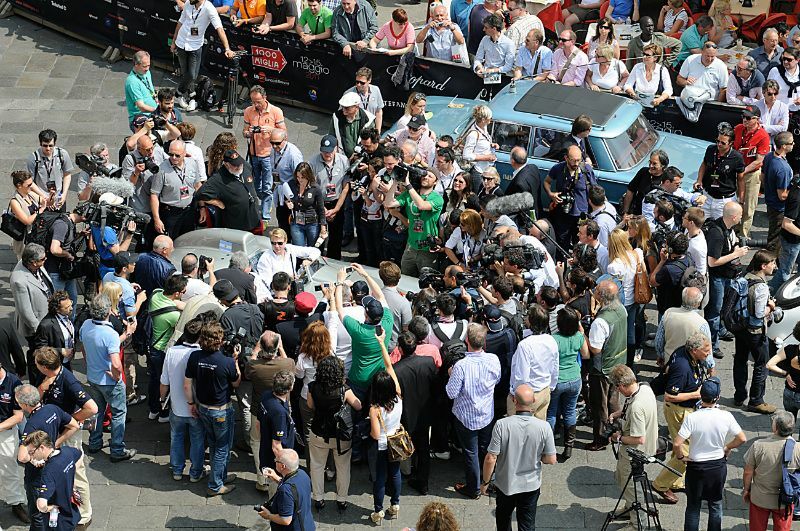 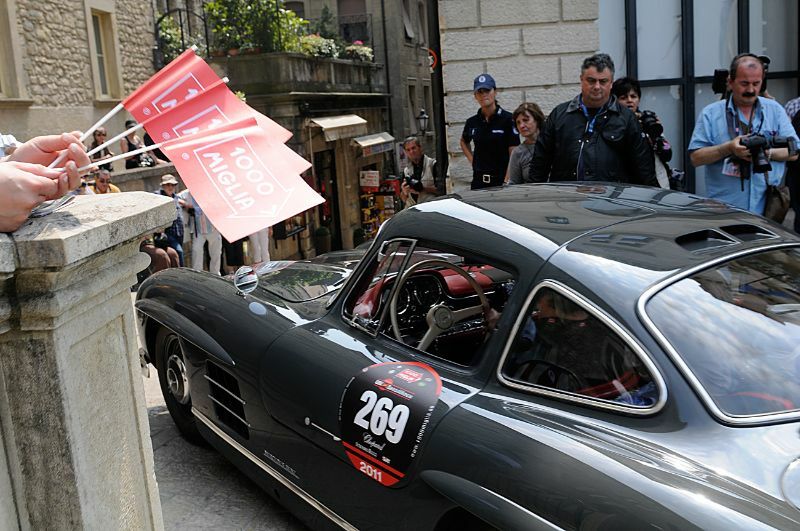 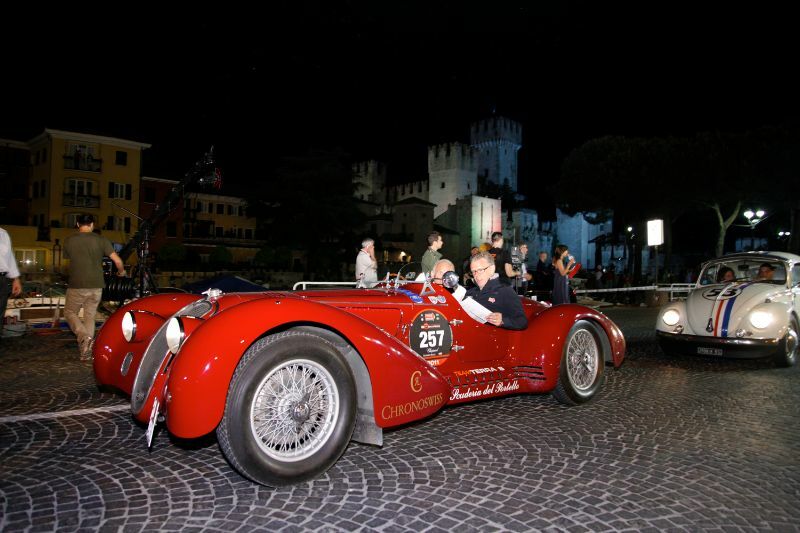 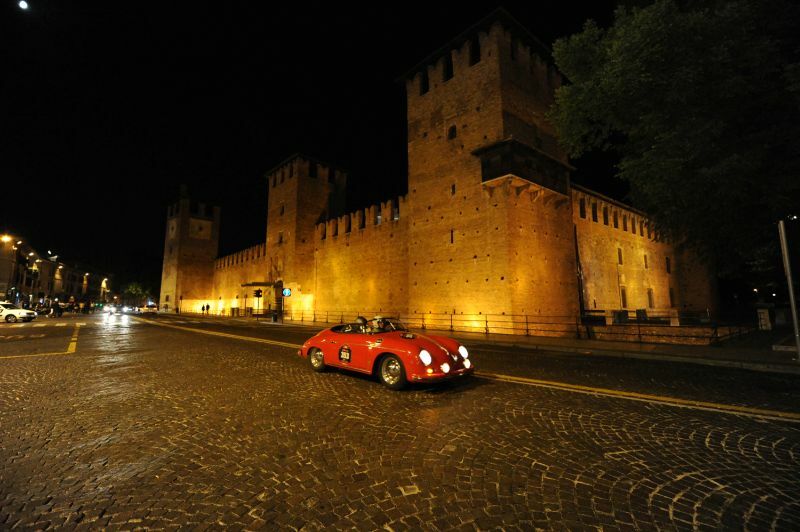 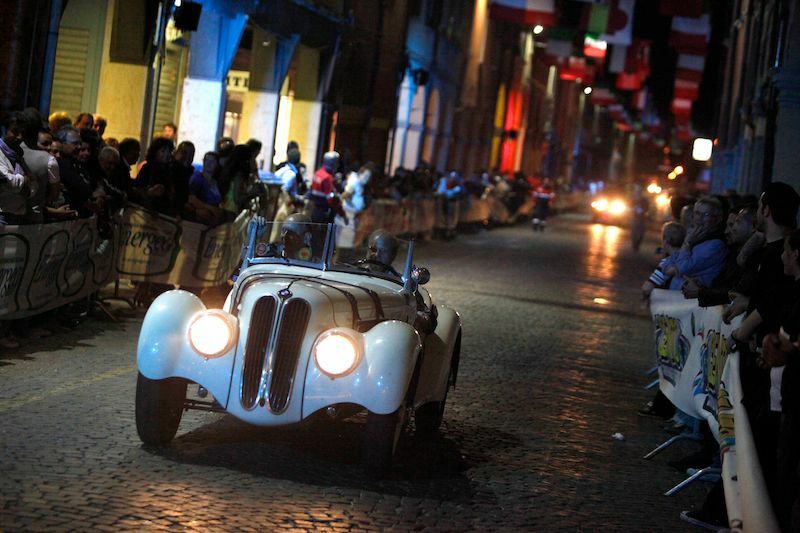 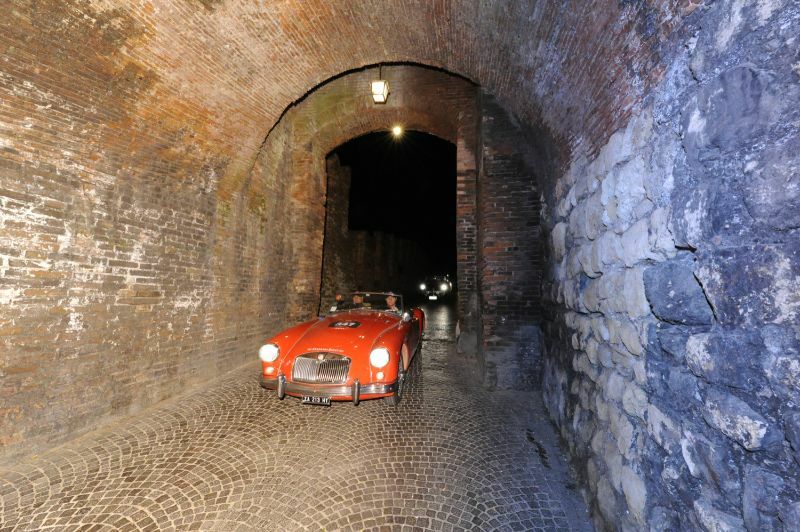 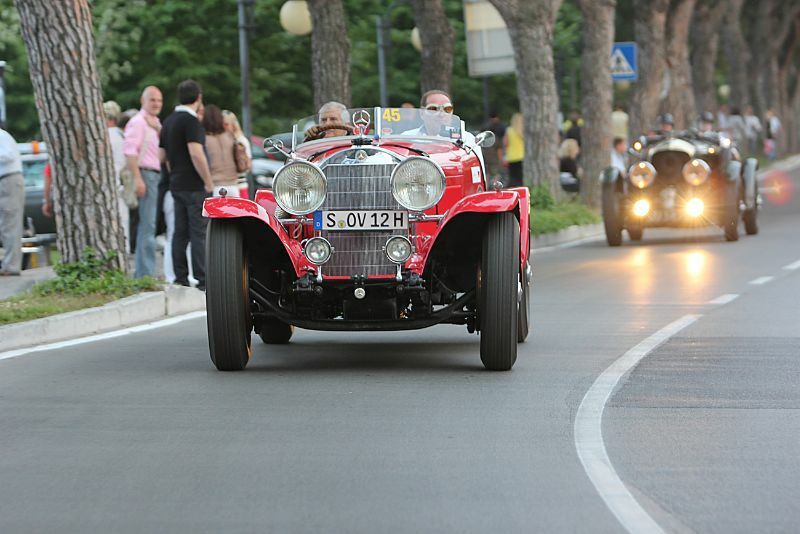 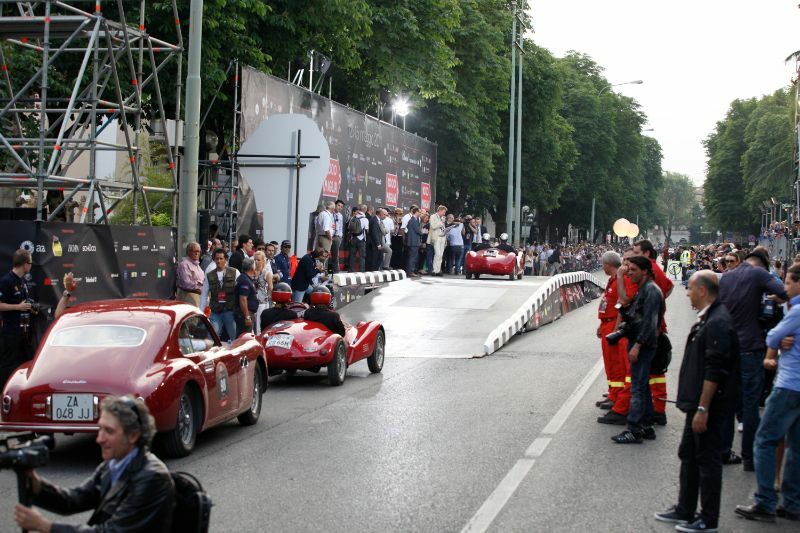 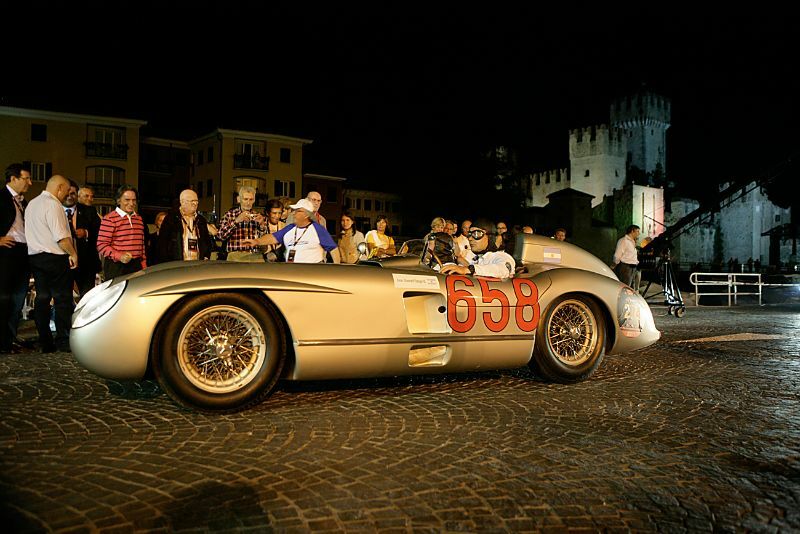 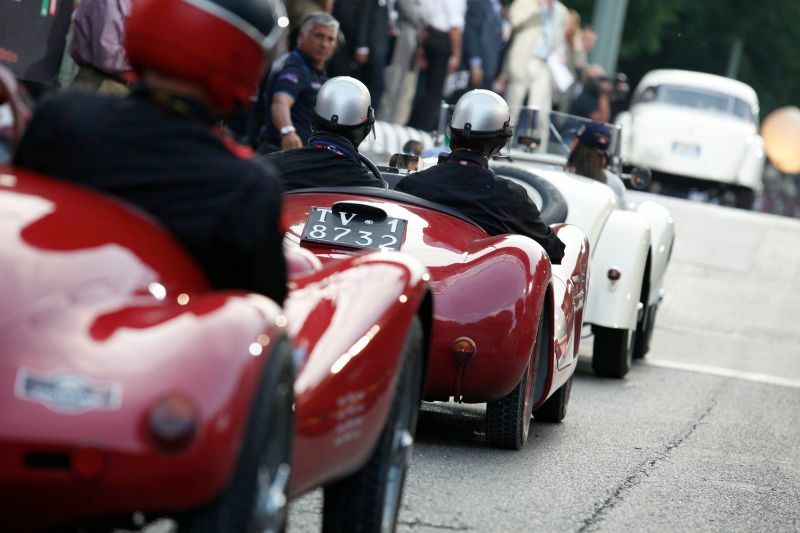 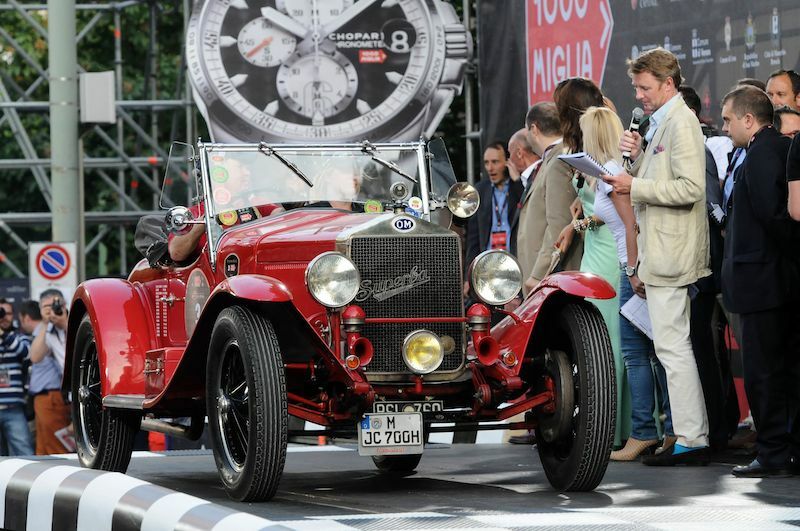 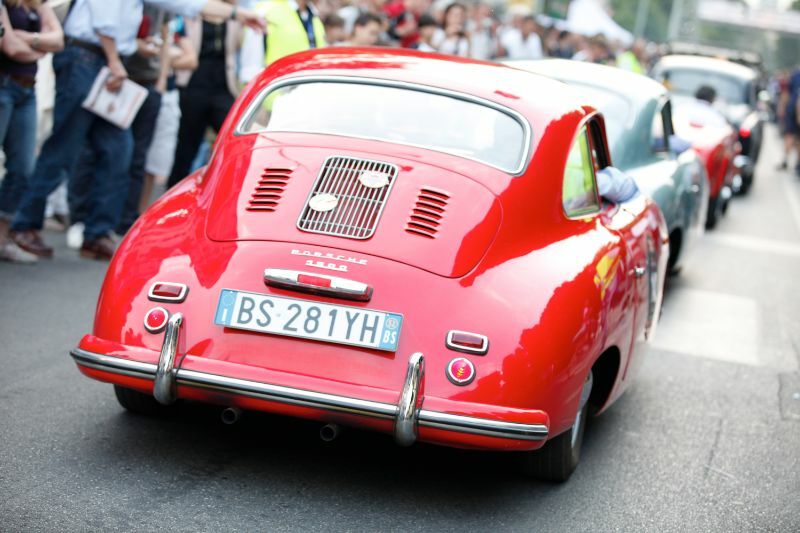 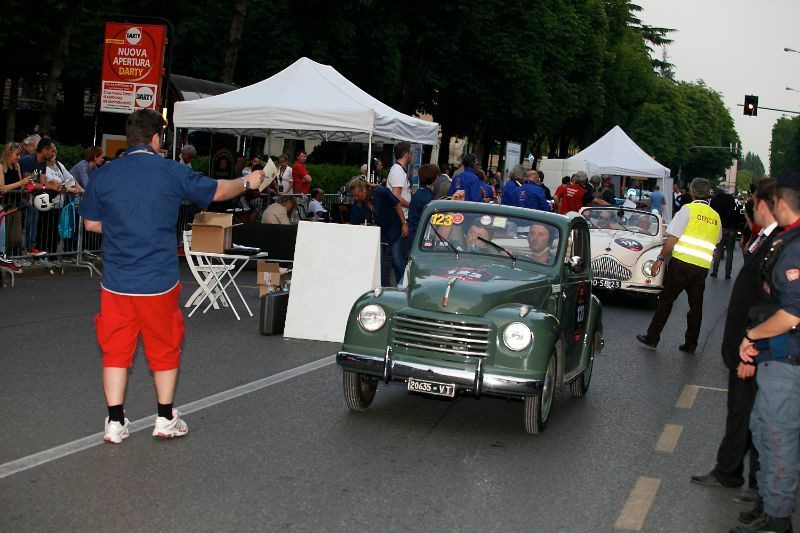 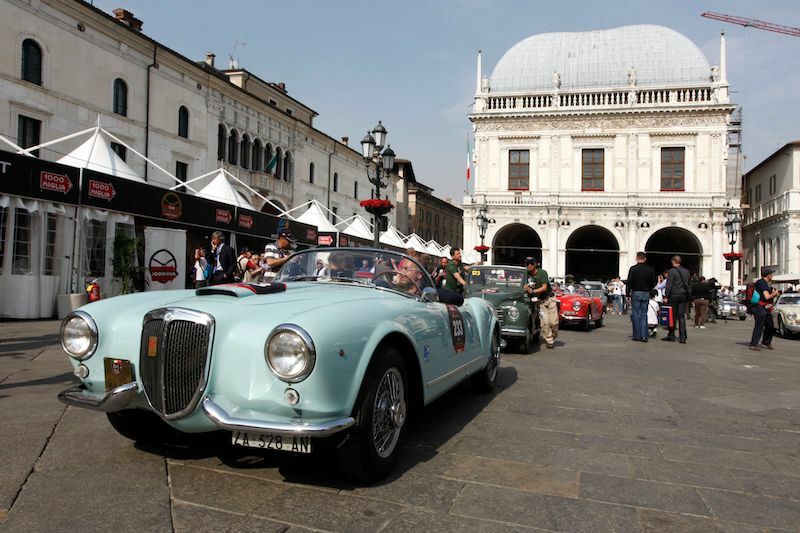 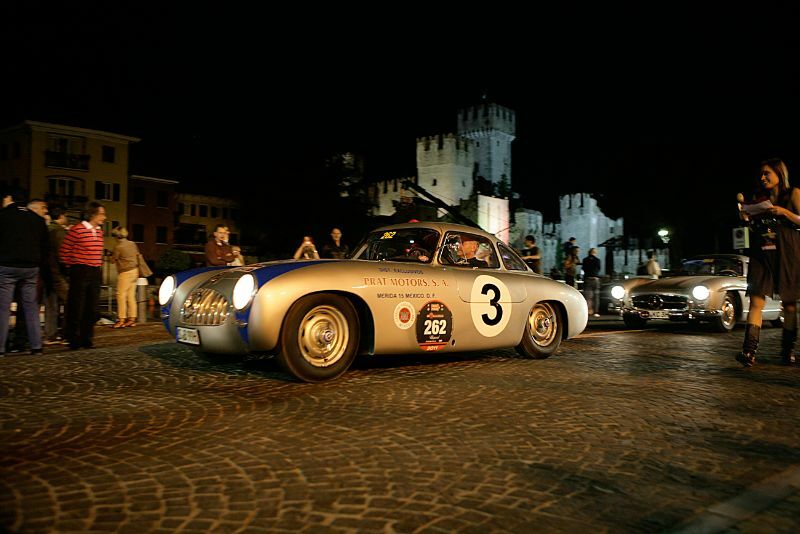 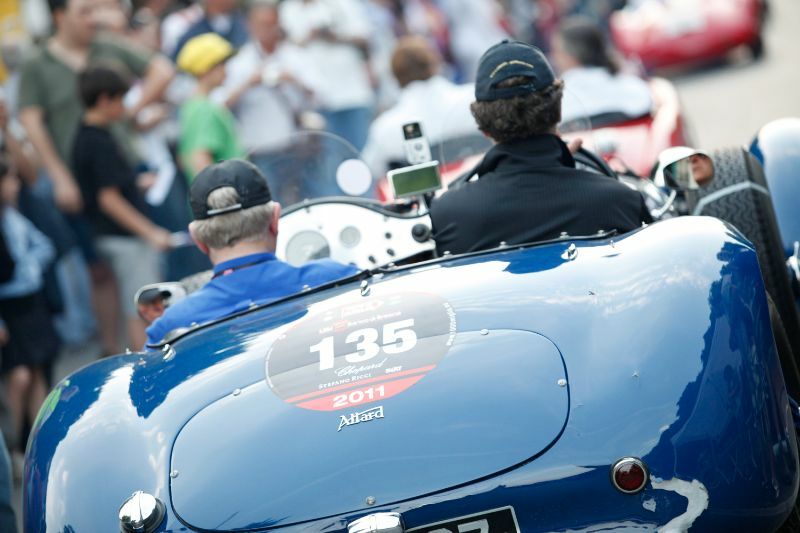 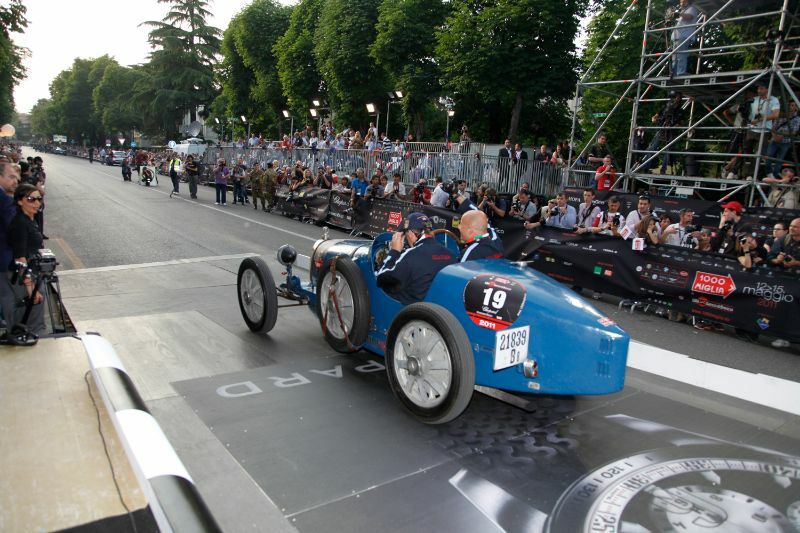 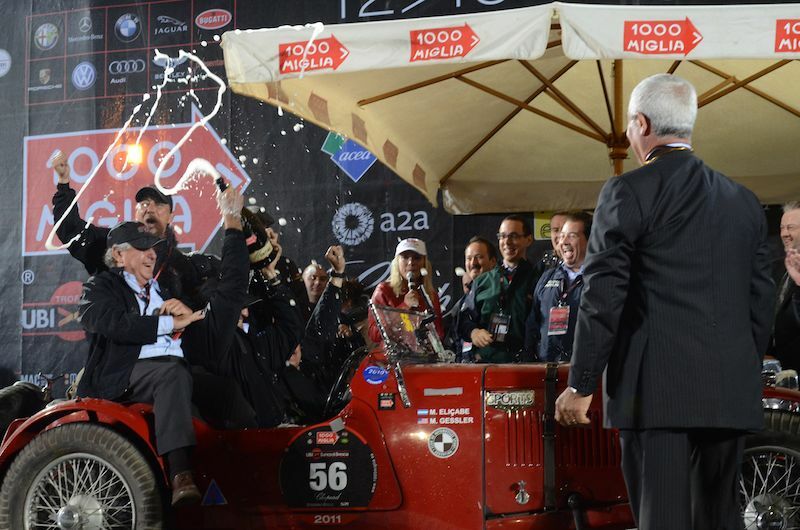 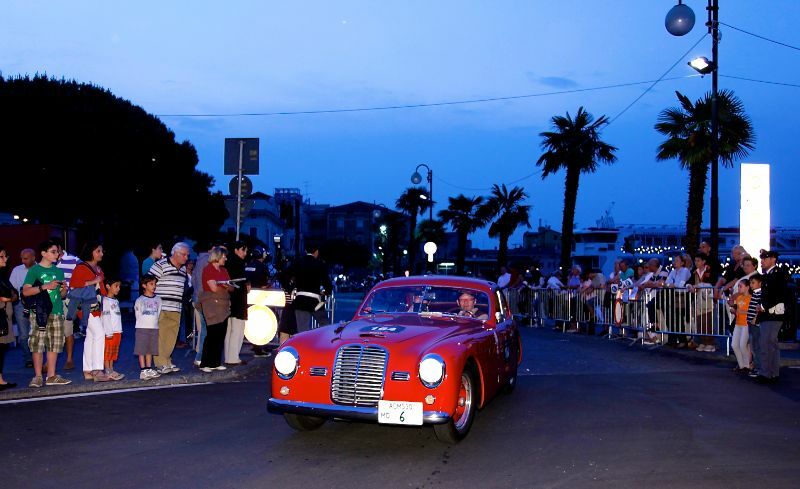 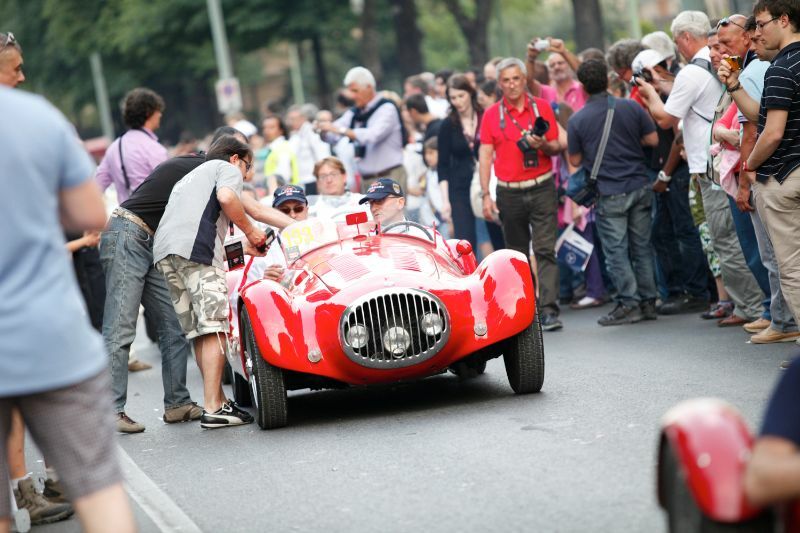 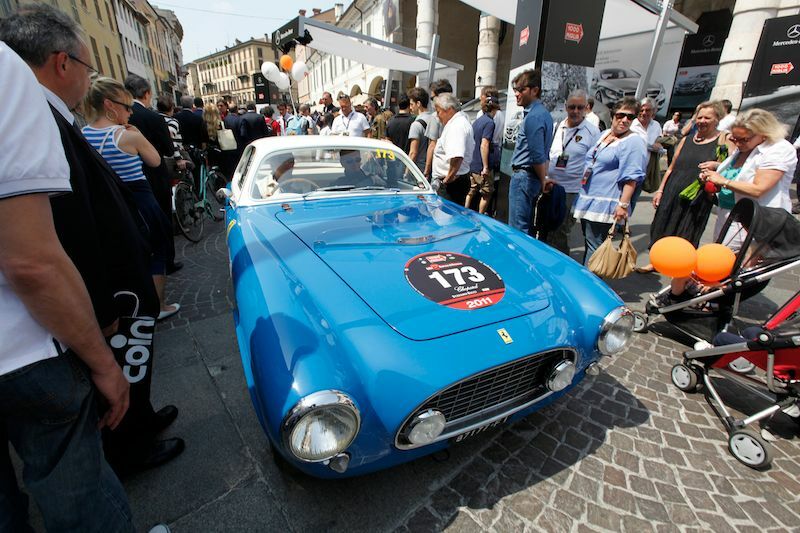 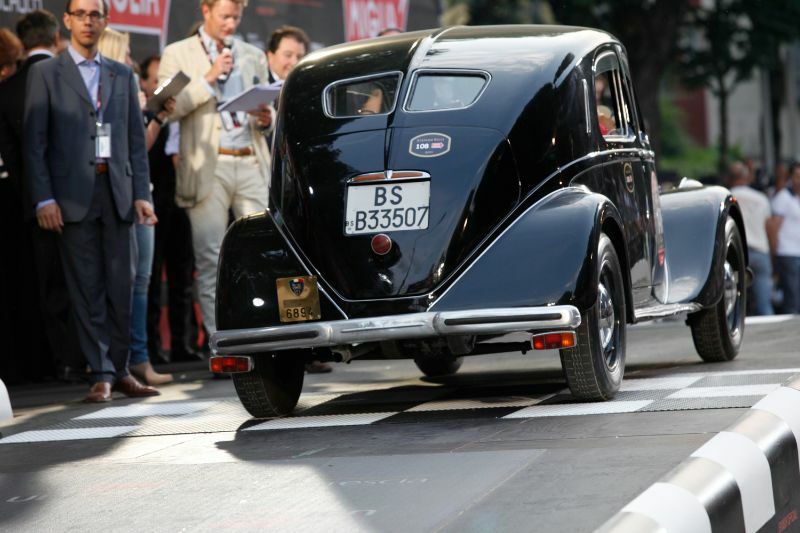 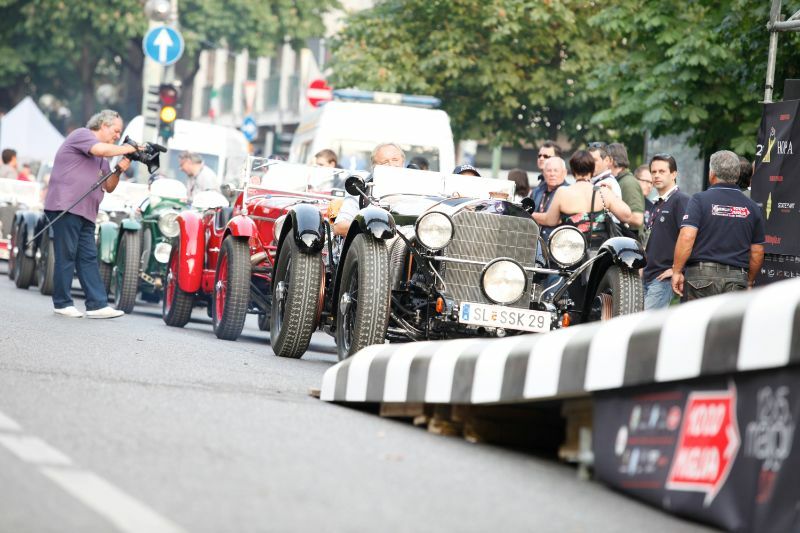 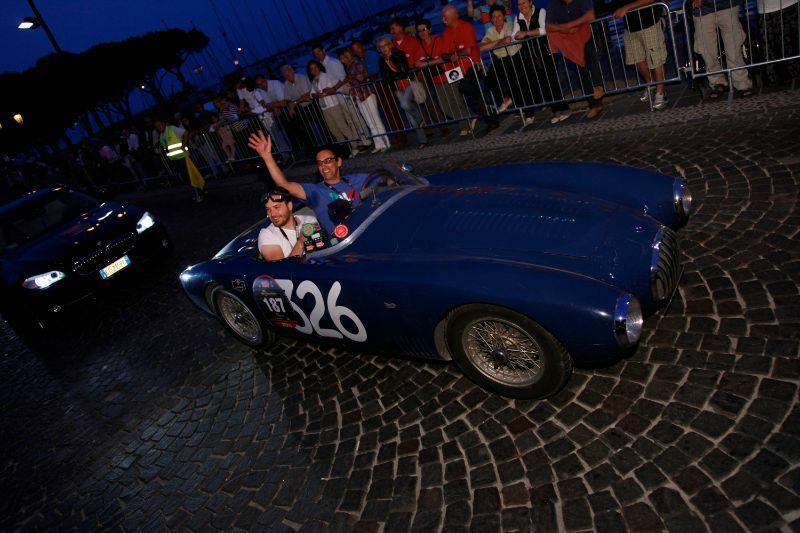 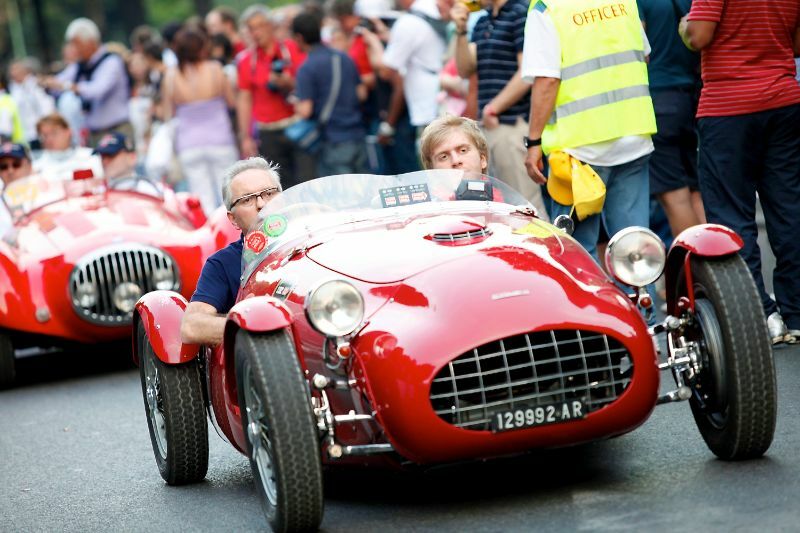 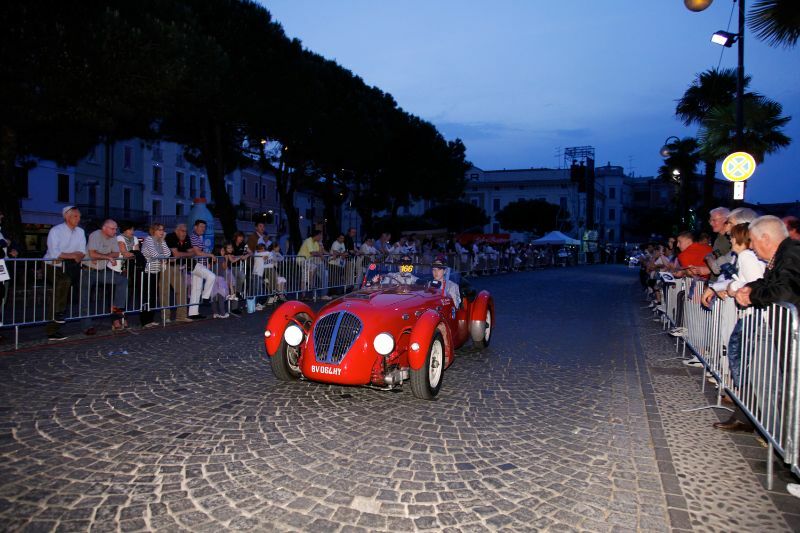 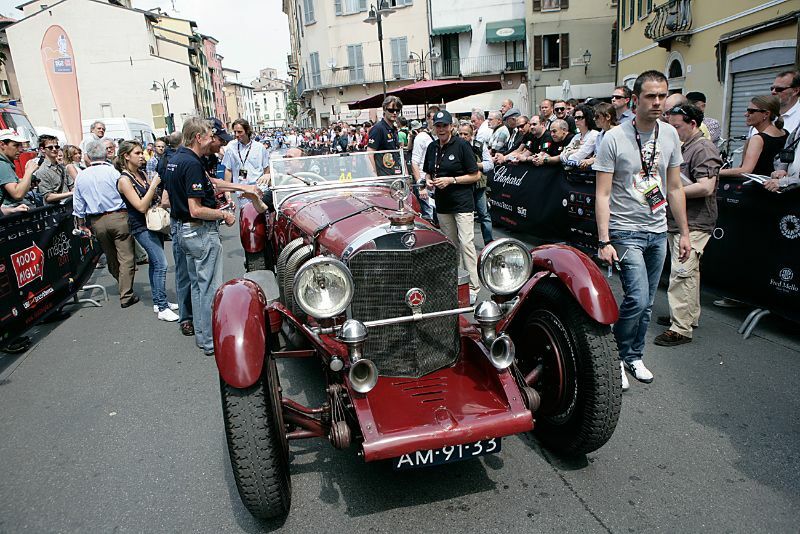 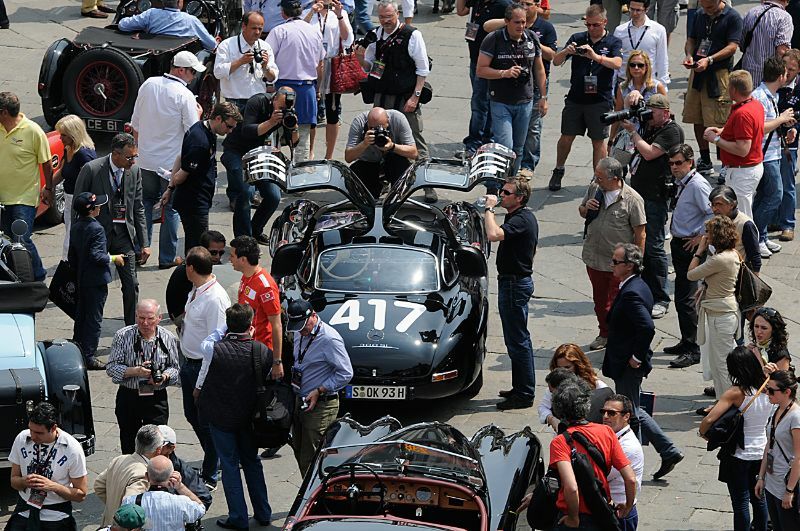 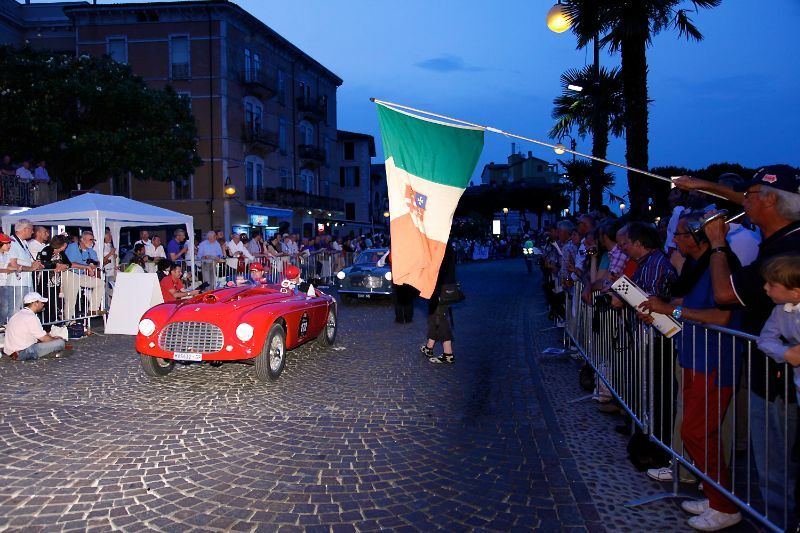 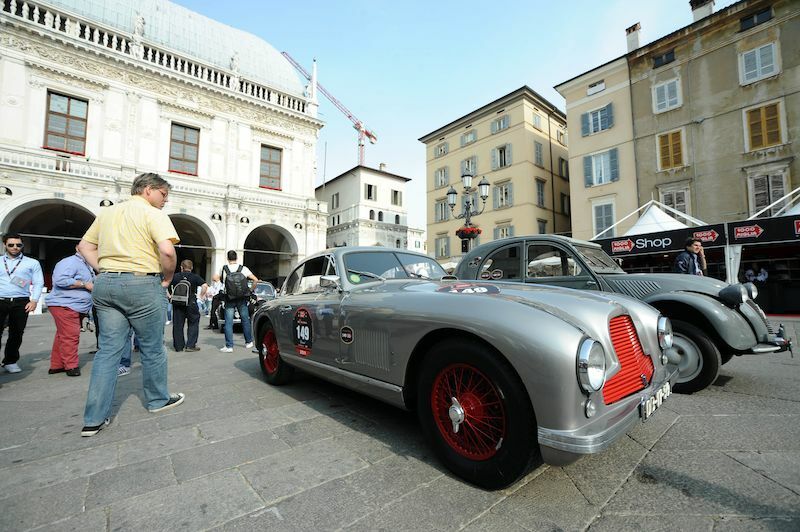 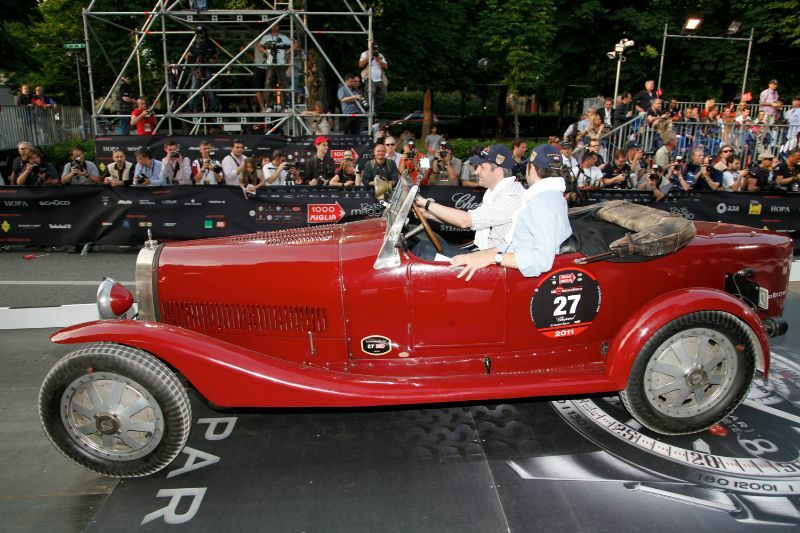 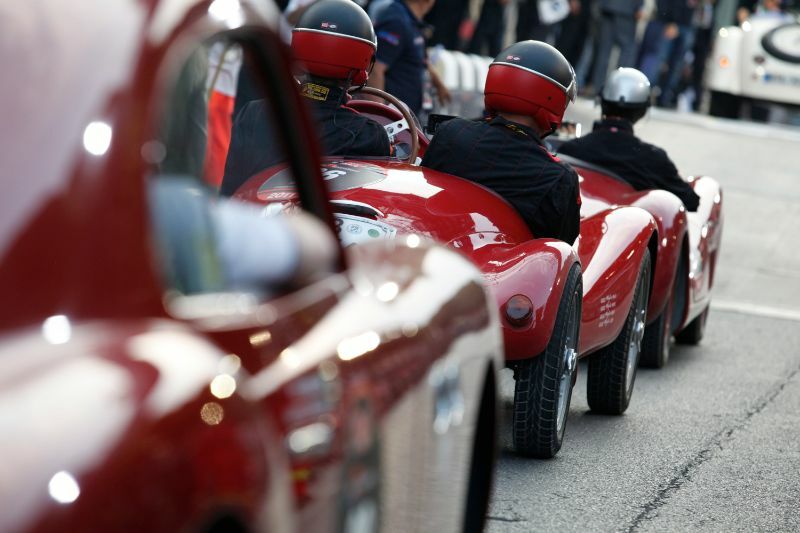 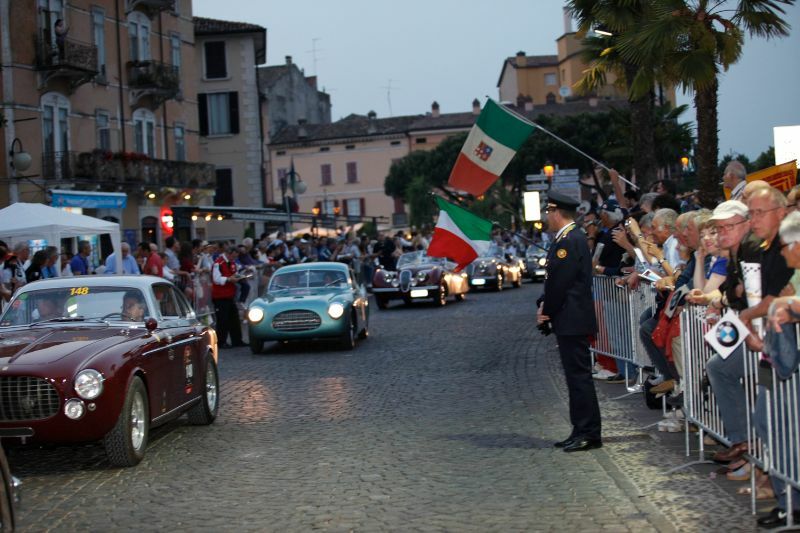 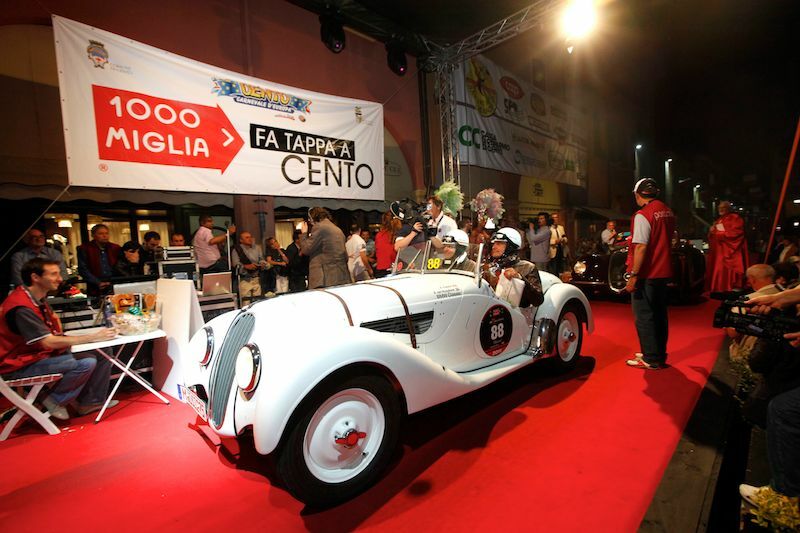 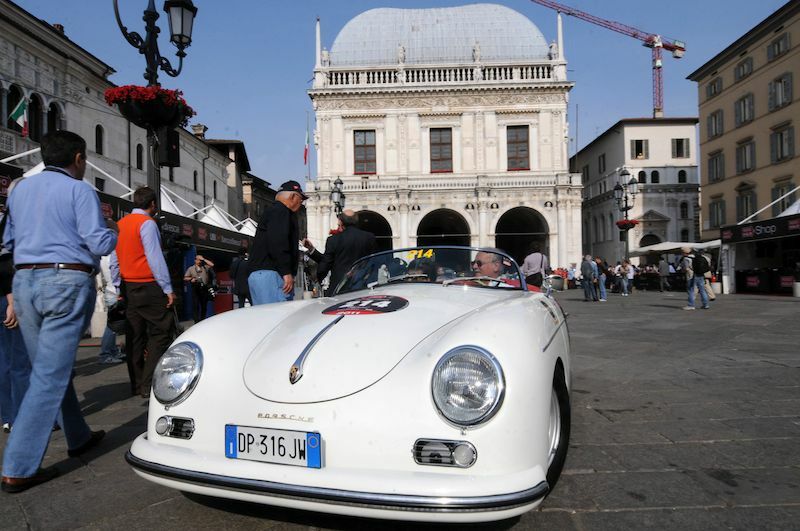 The Mille Miglia Storica 2011 was conducted May 11-14, starting and ending in Brescia, Italy. 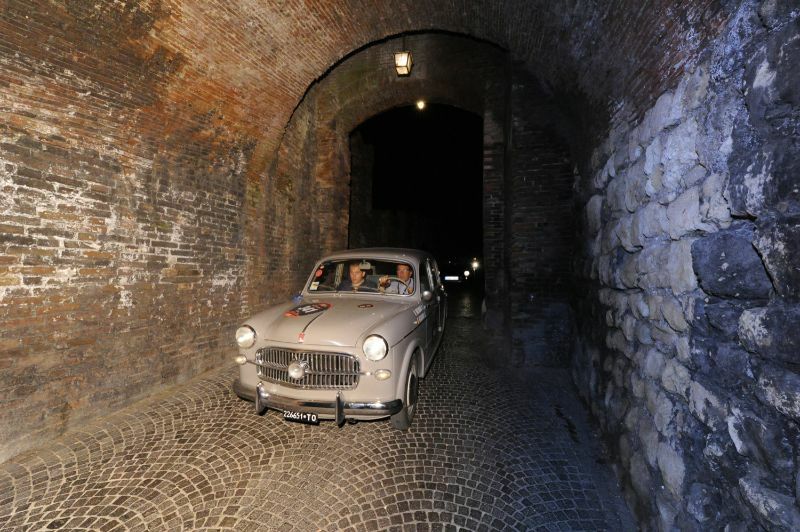 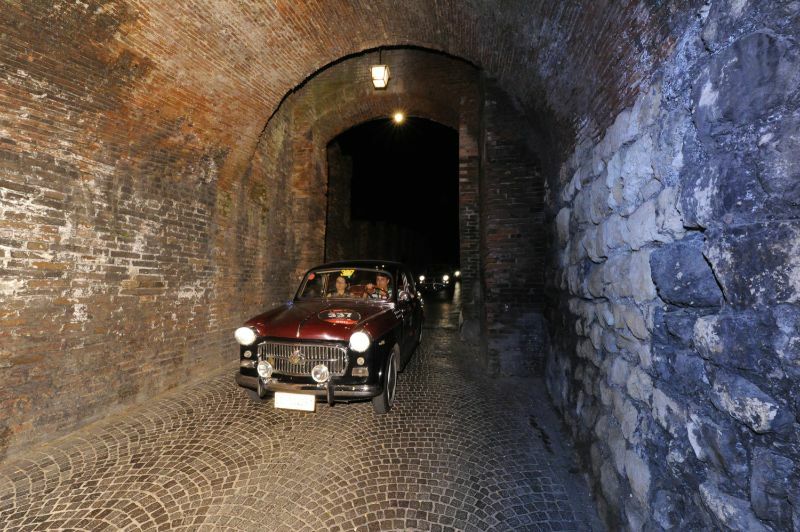 Along the historic route from Brescia to Rome and back, 375 cars—selected from over 1,400 requests—built between 1927 and 1957 challenged each other and themselves in the modern-day revival of the famed Mille Miglia. 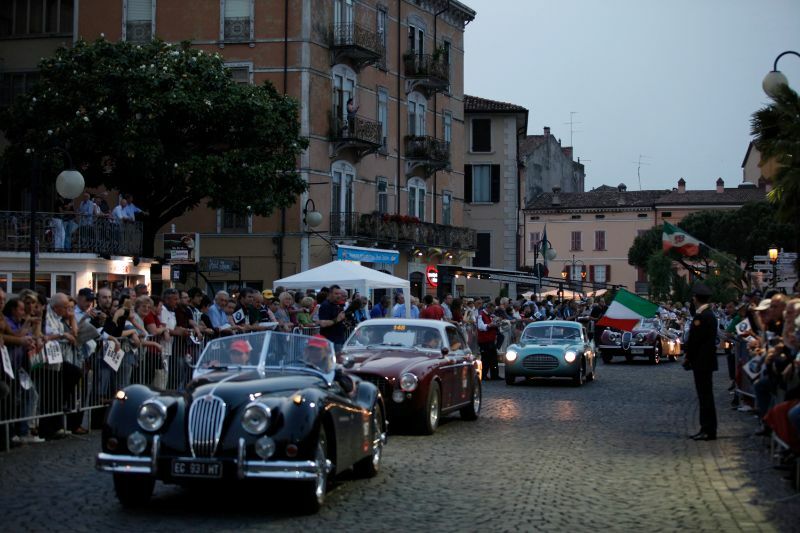 The participants crossed seven regions of Italy, 177 towns, and one foreign state (San Marino) passing through some of the most picturesque areas of the Italian landscape. 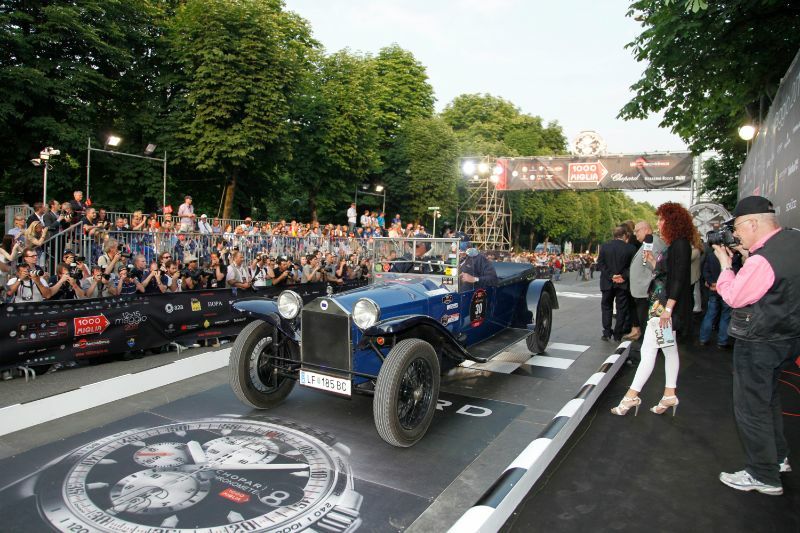 In a race where the top three battled it out along the whole 1,000 mile historic Brescia-Rome-Brescia route, the Mille Miglia 2011 was won by the husband and wife team of Giordano Mozzi and Stefania Biacca in their 1933 Aston Martin Le Mans. 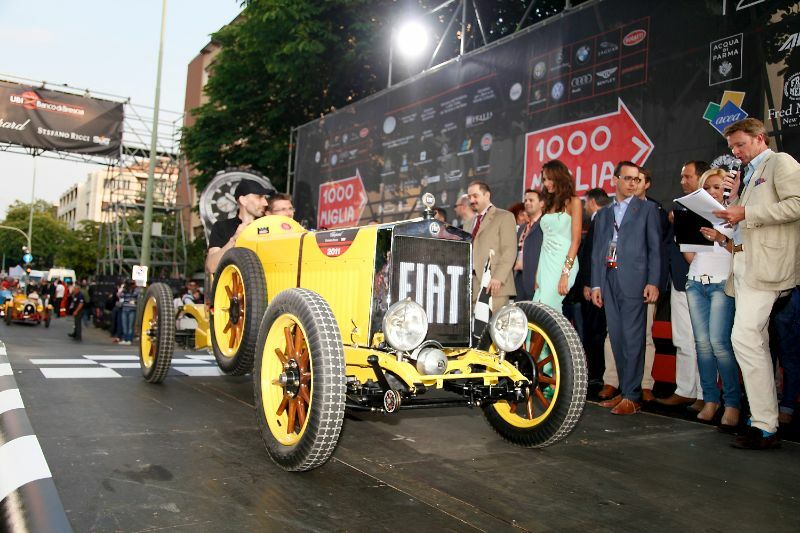 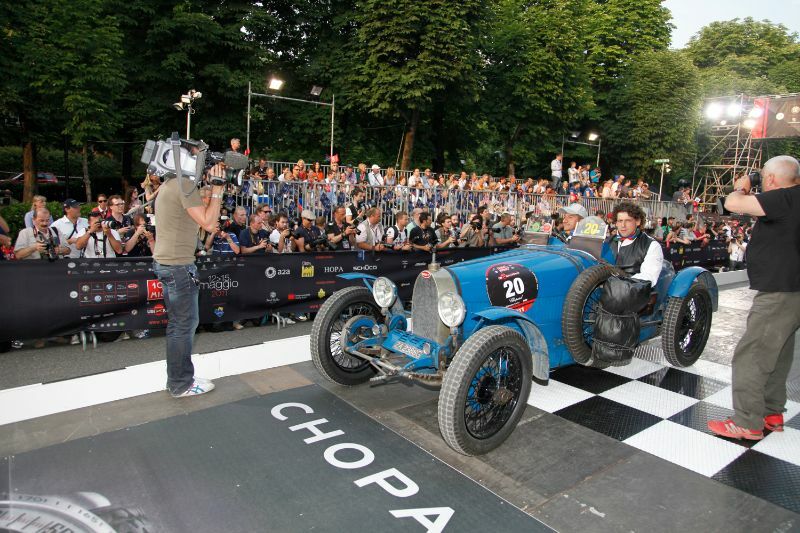 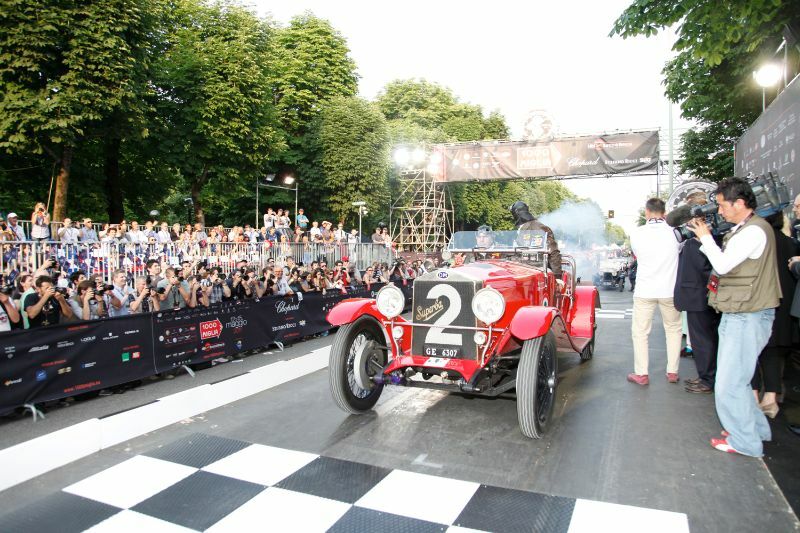 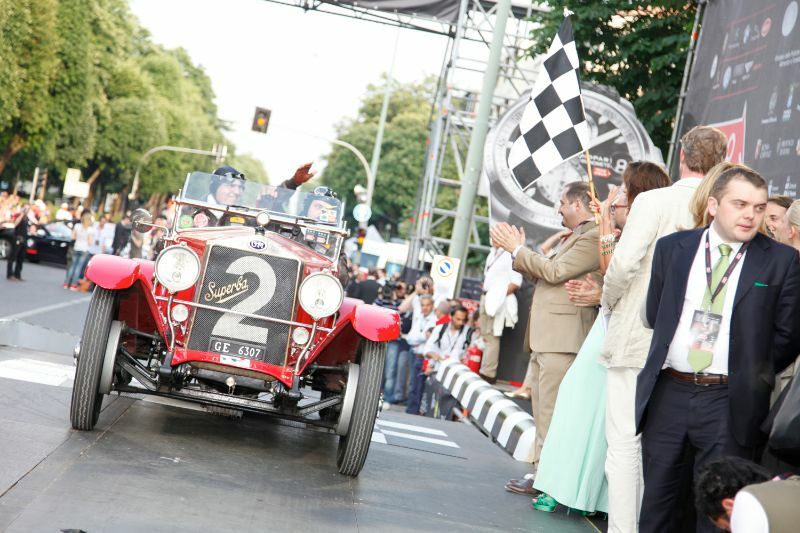 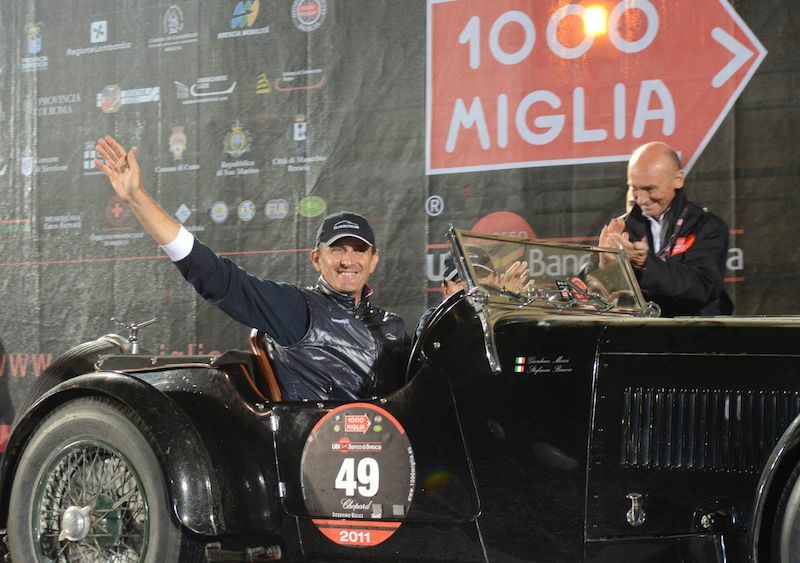 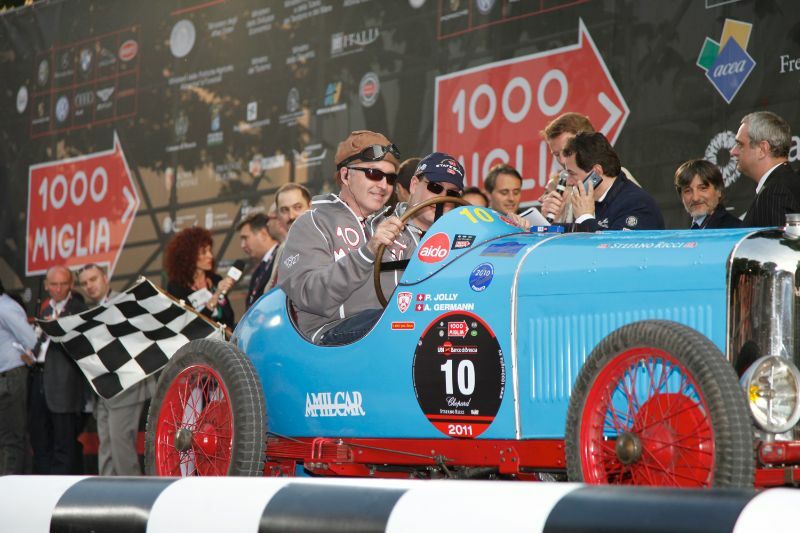 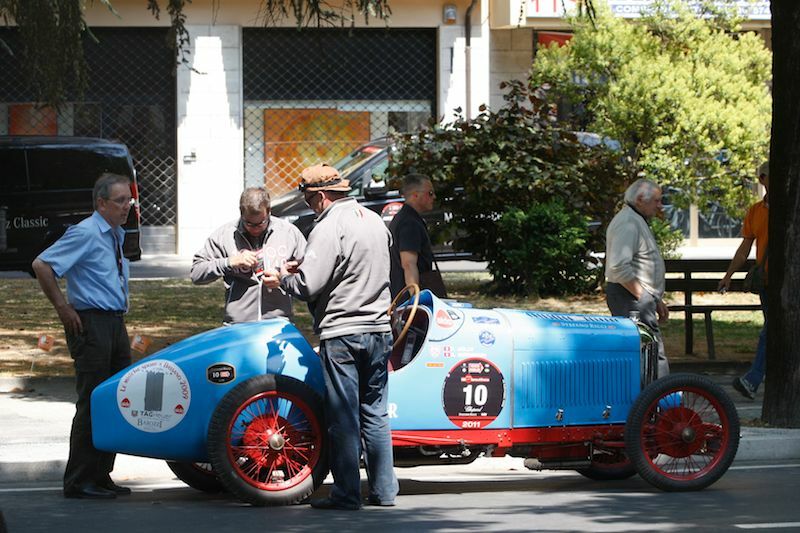 In a challenging race the like of which has never been seen before, with the public rooting them on, they managed to keep ahead of the 1927 Bugatti Type 37 of father and son Bruno and Carlo Ferrari and the 1933 Alfa Romeo 6C 1500 GS of Claudio Scalise and Daniel Claramunt. 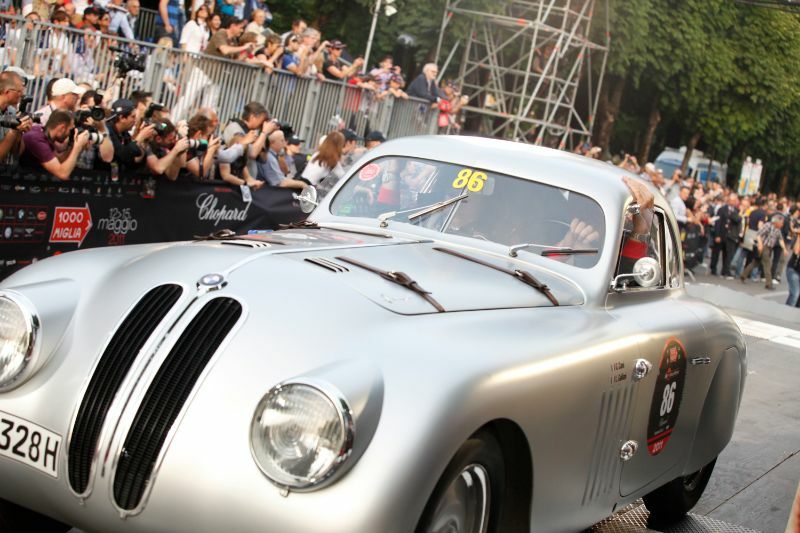 Out of the running in 2011 was the 1939 BMW 328 Mille Miglia Coupe of Giuliano Cane, one of the favorites, the winner of the race last year and of ten other Mille Miglias. 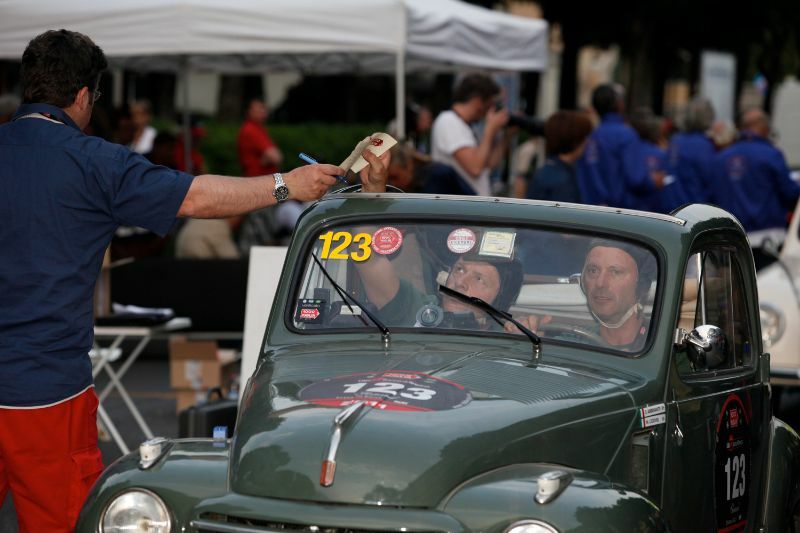 This year’s loss confirms his belief that he only wins in even years (not odd). 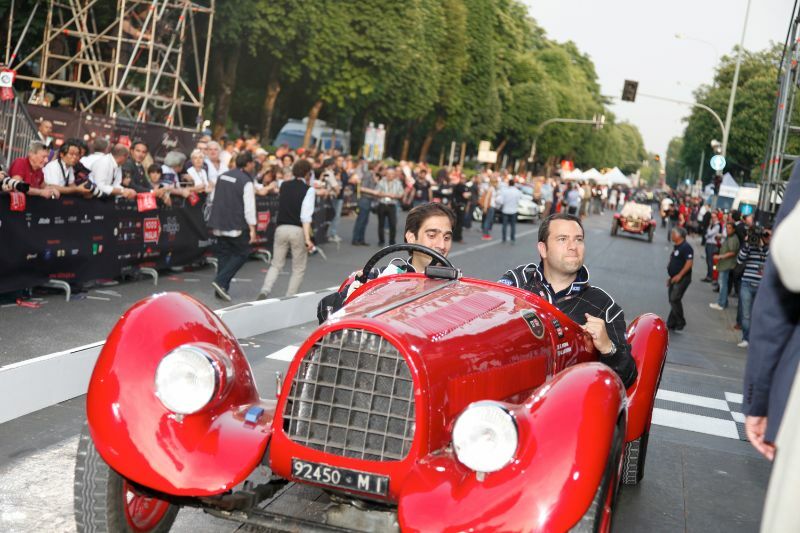 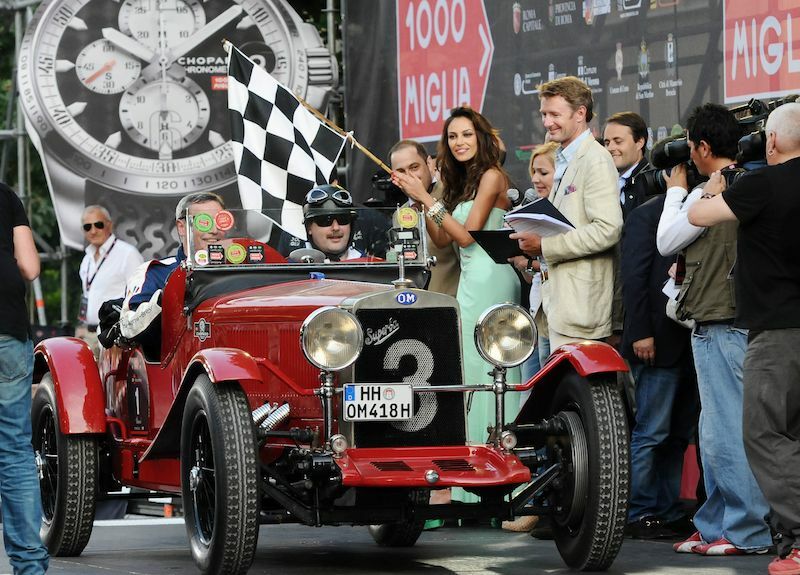 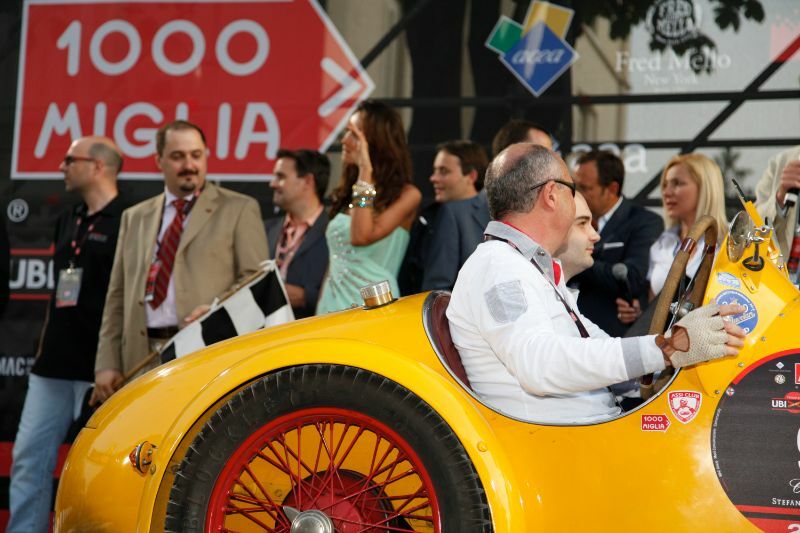 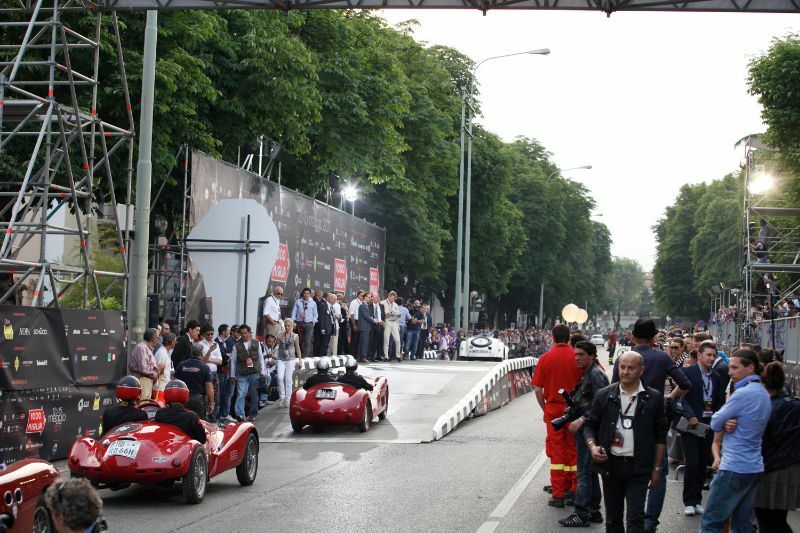 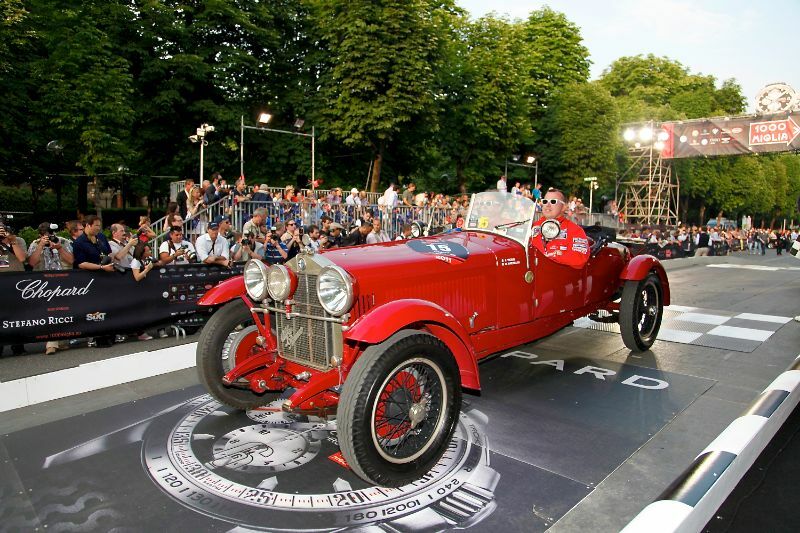 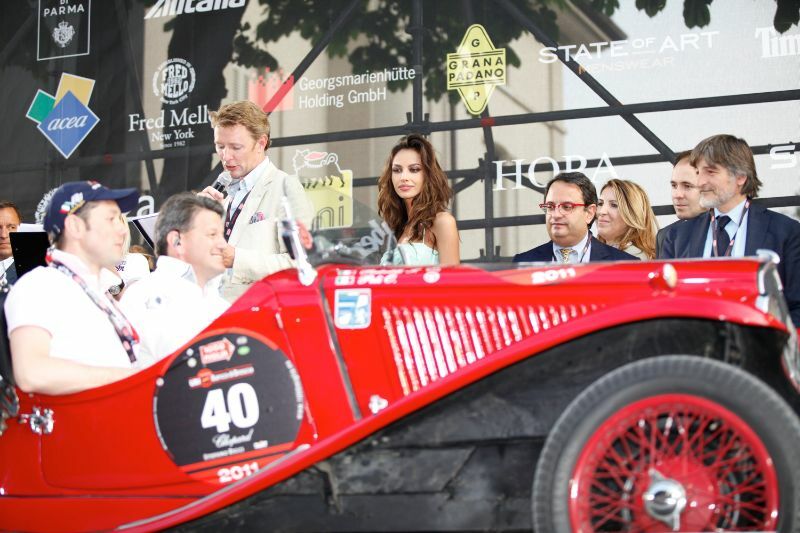 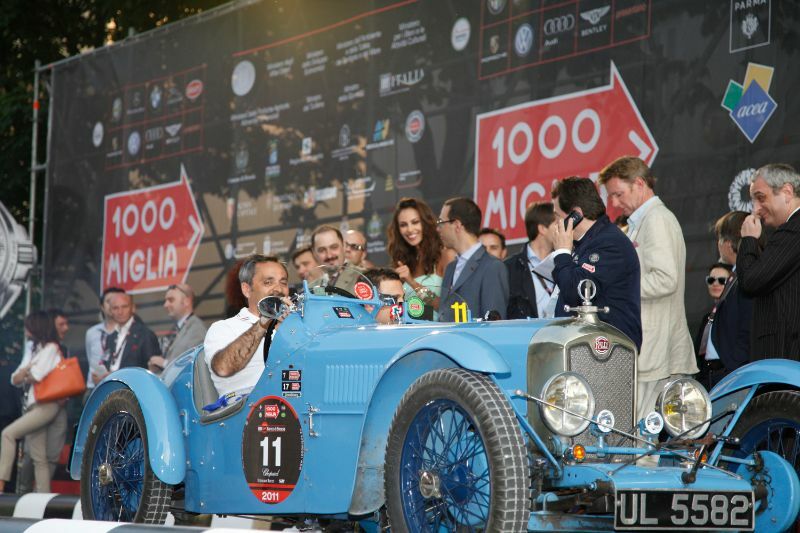 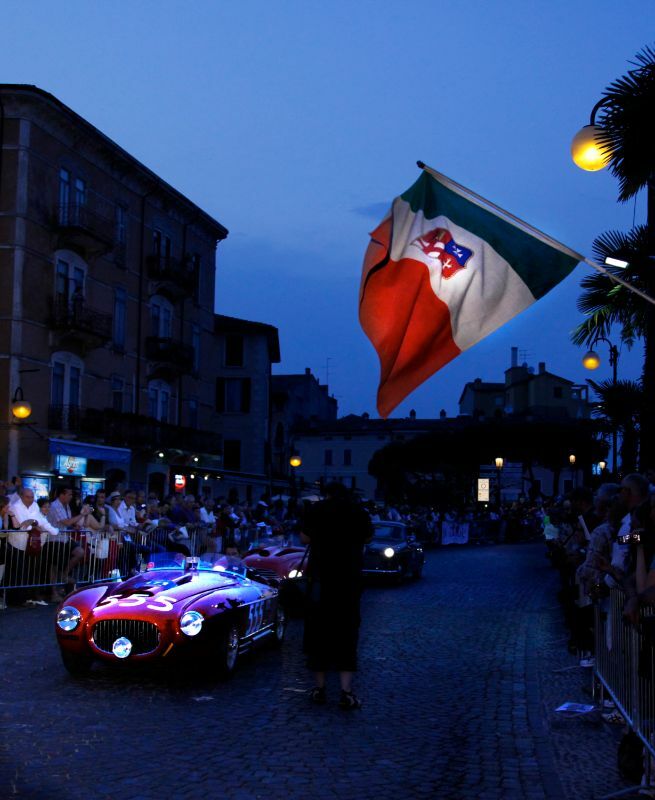 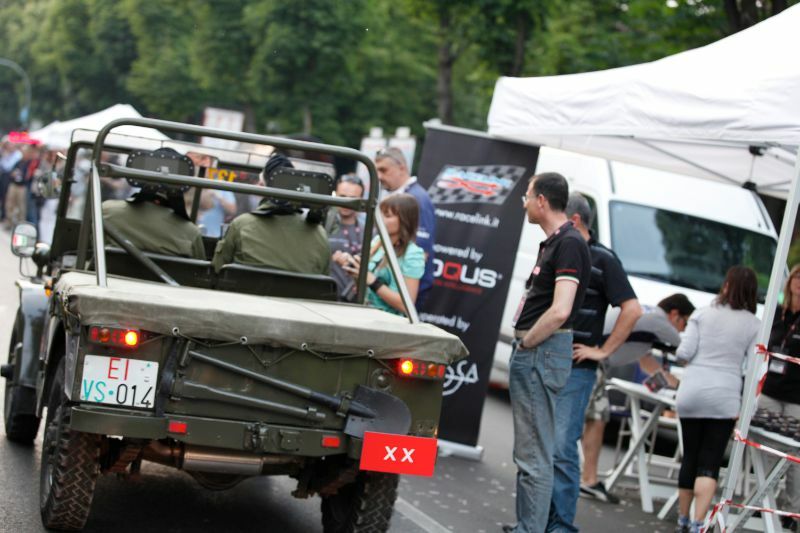 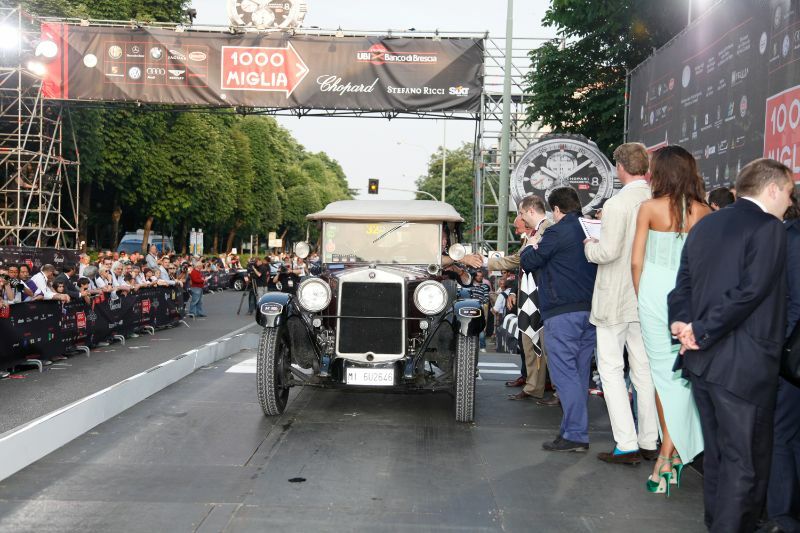 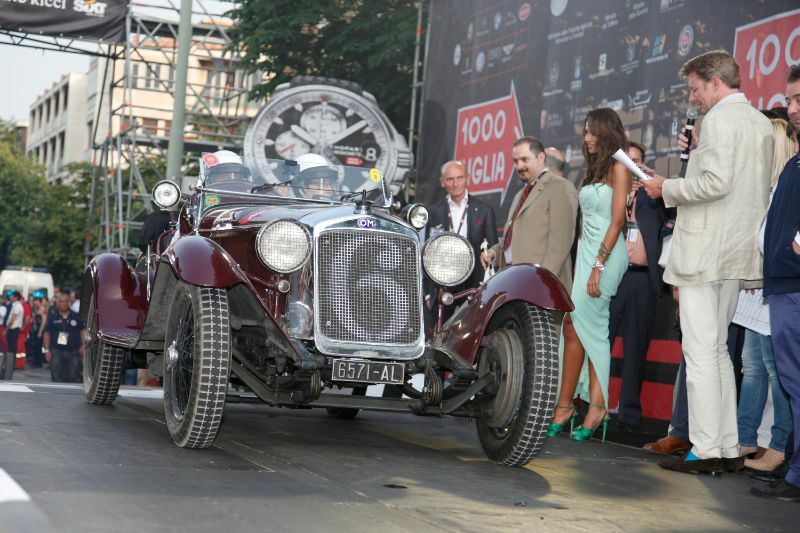 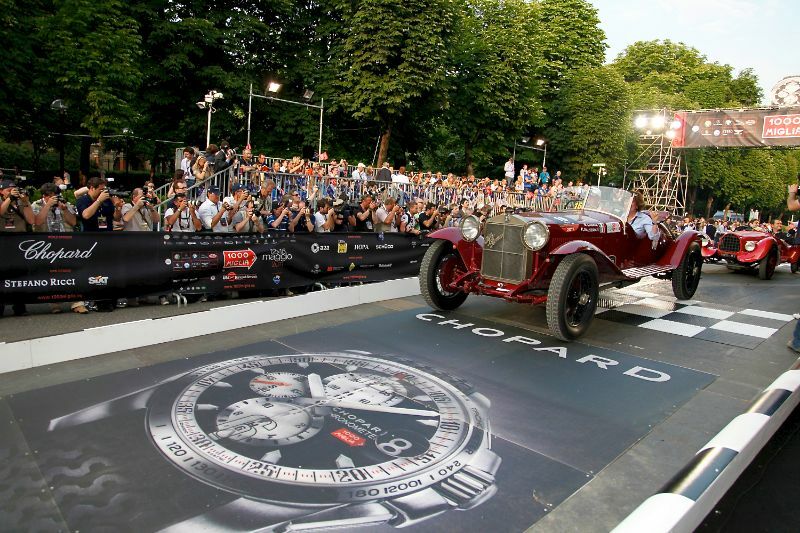 The Mille Miglia 2011 started on Thursday, May 12 at Viale Venezia in Brescia, officially kicked-off by the godmother of this year’s Mille Miglia, Madalina Ghenea. 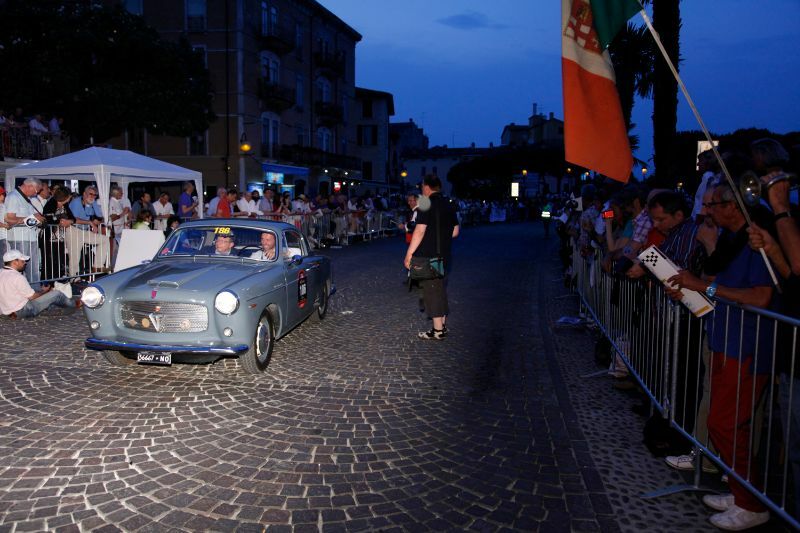 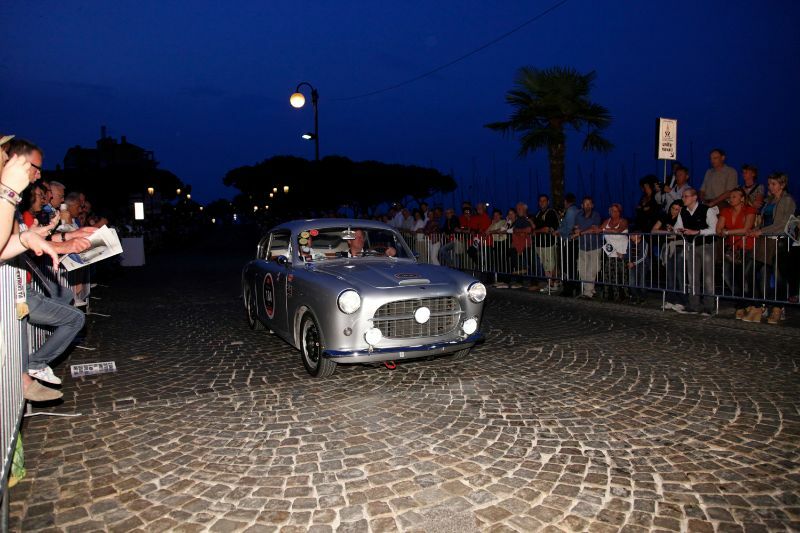 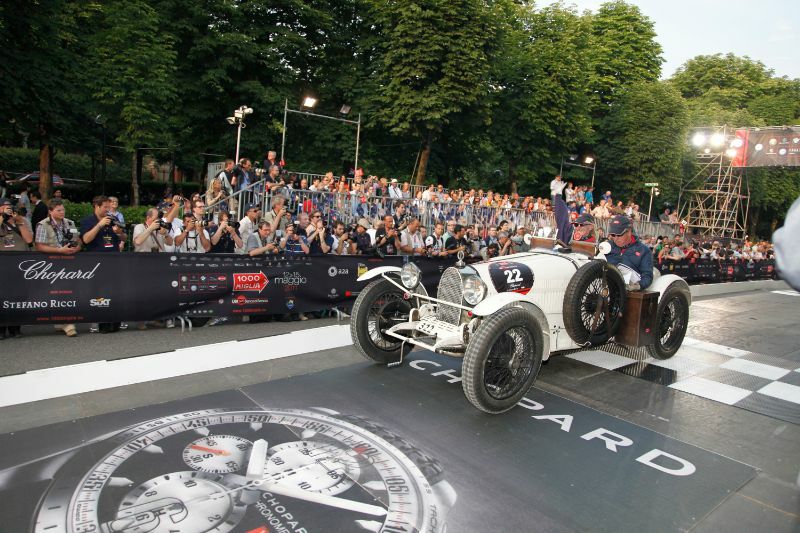 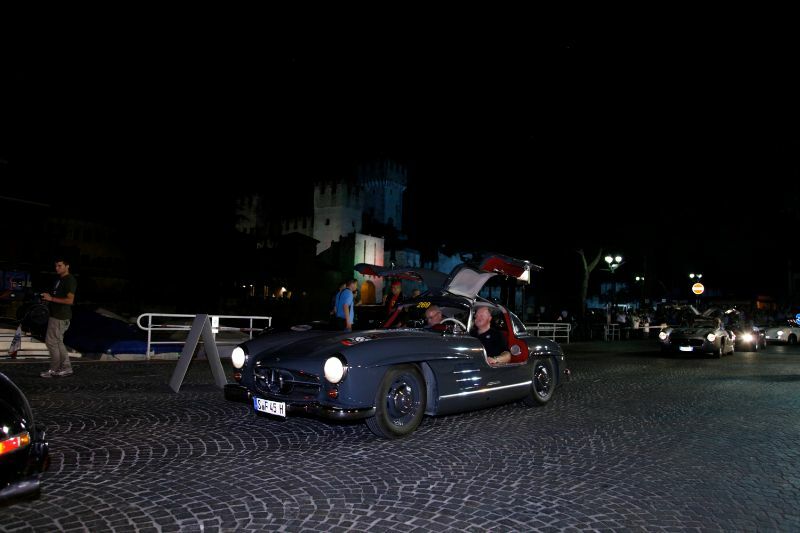 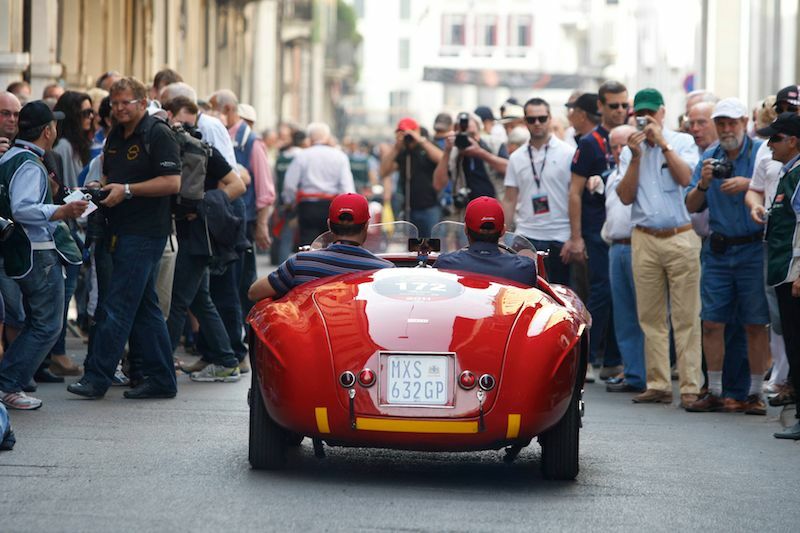 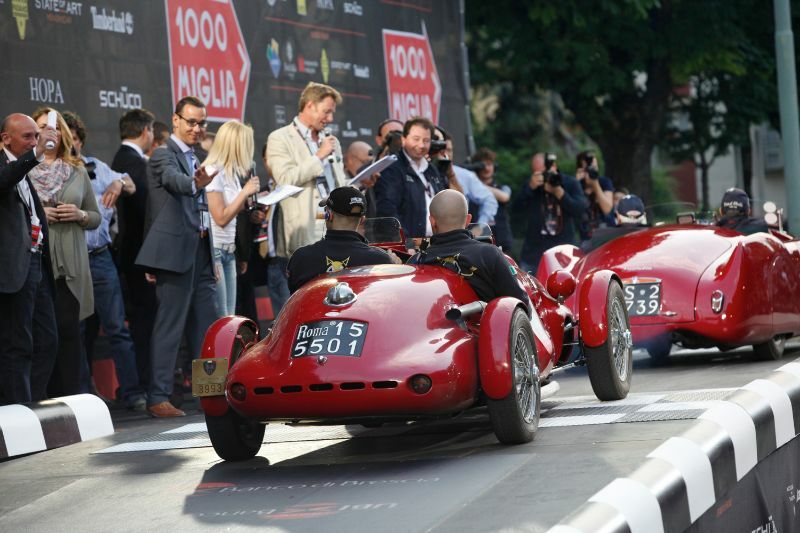 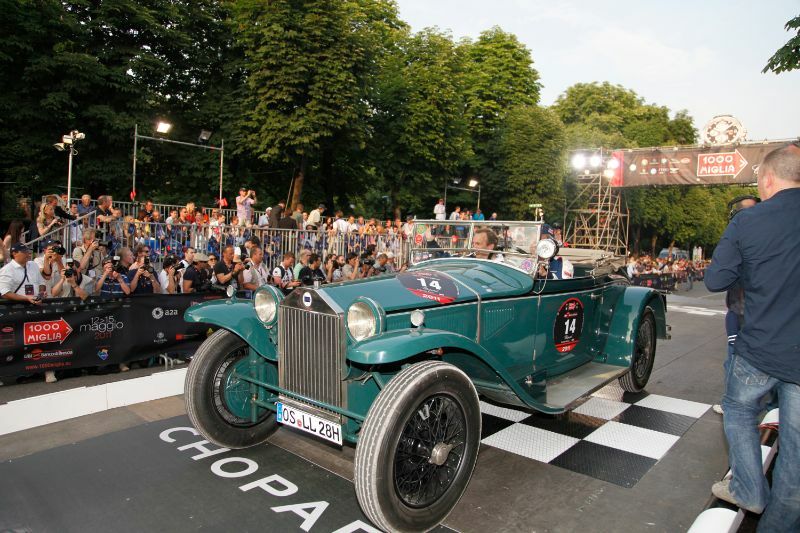 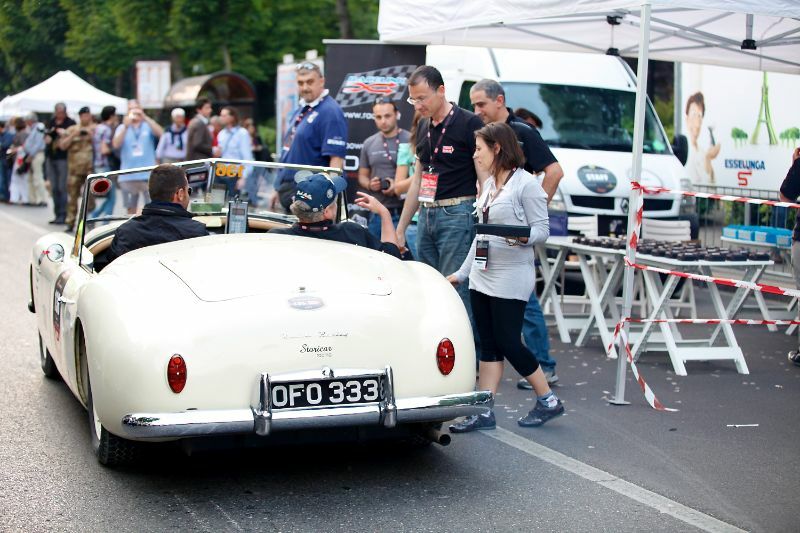 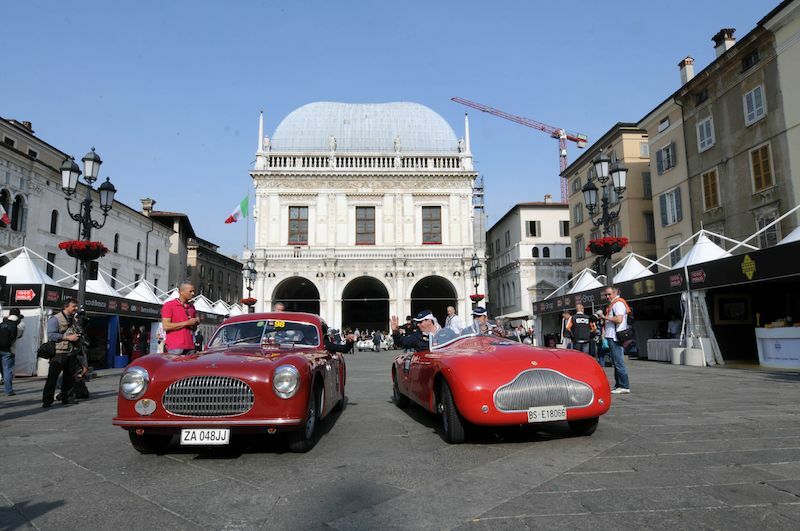 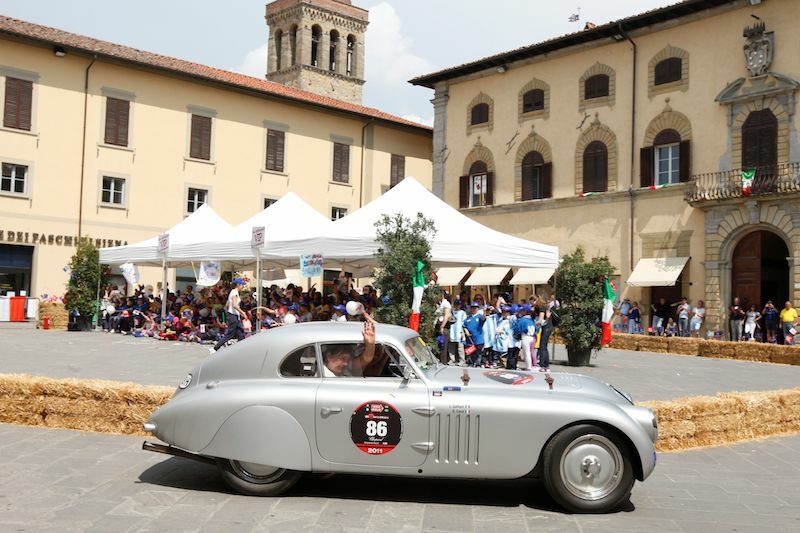 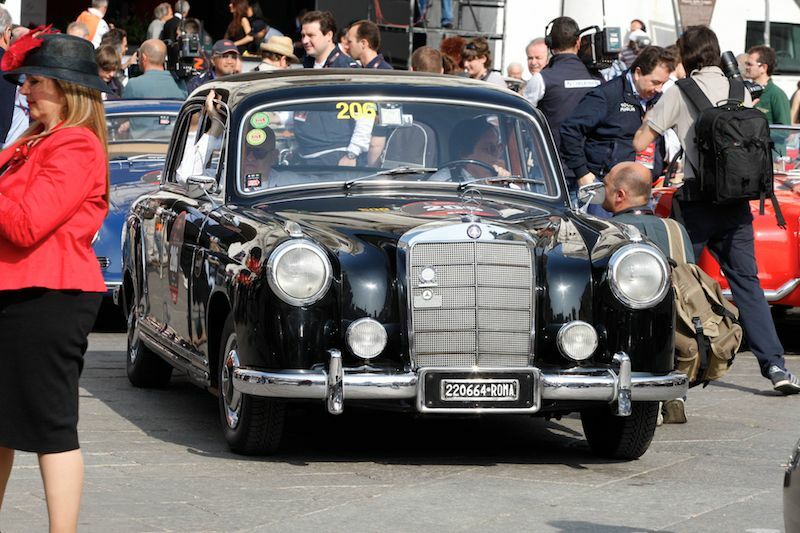 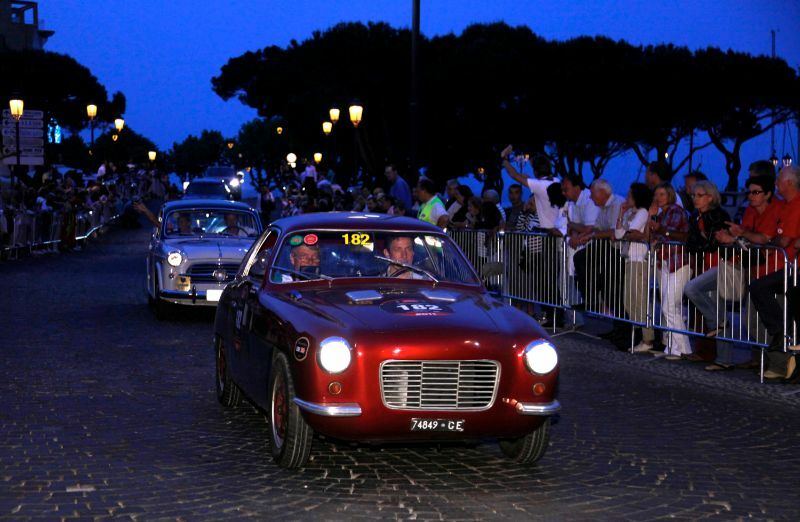 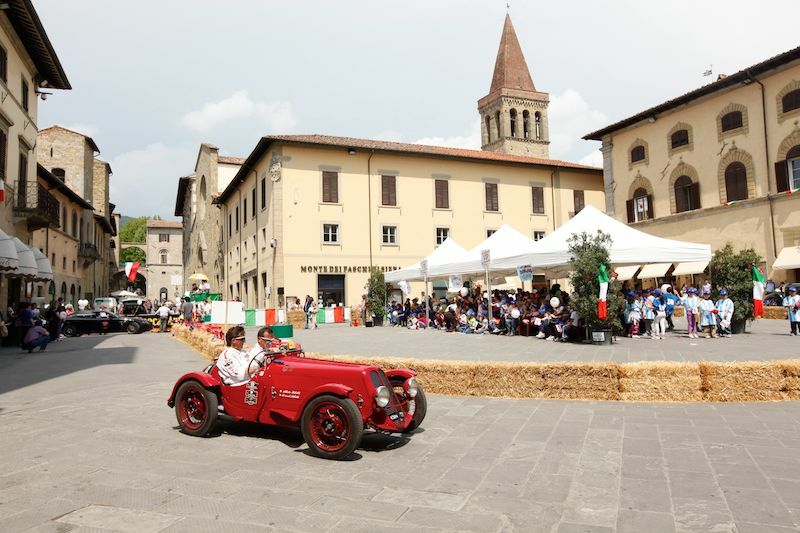 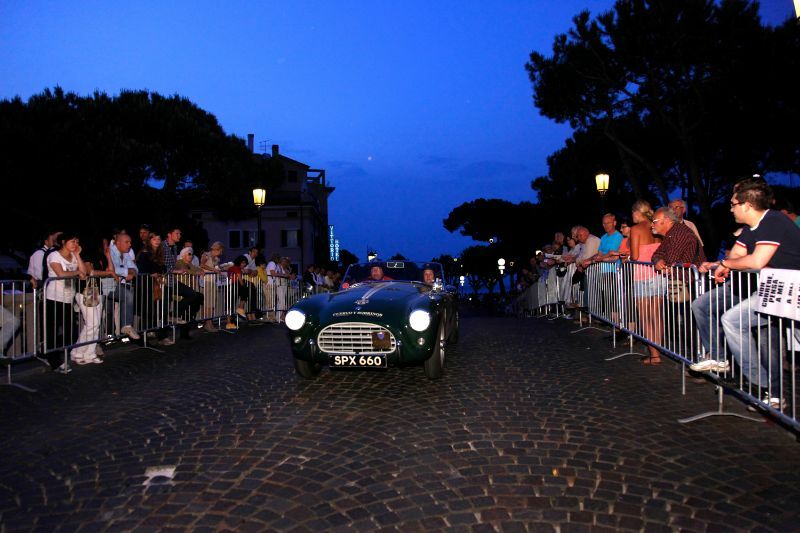 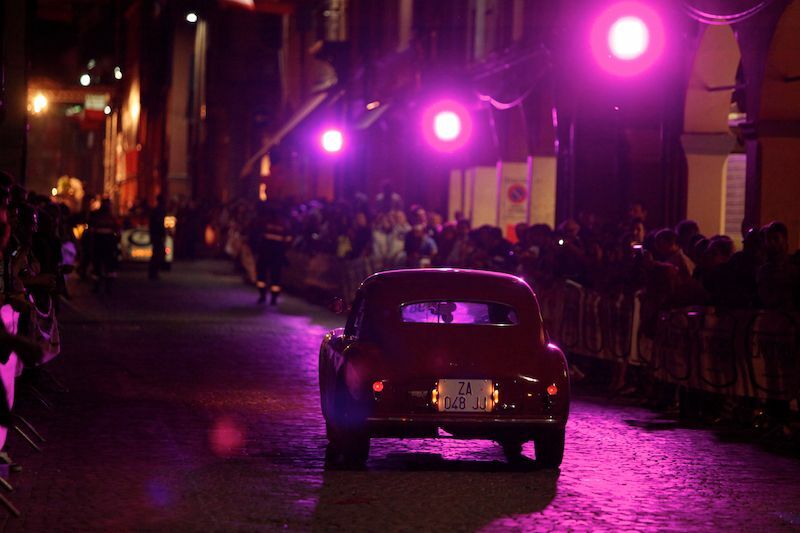 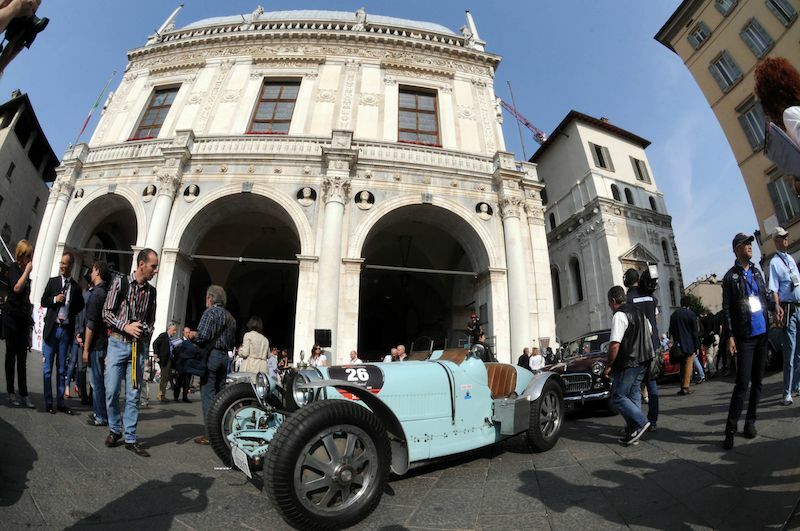 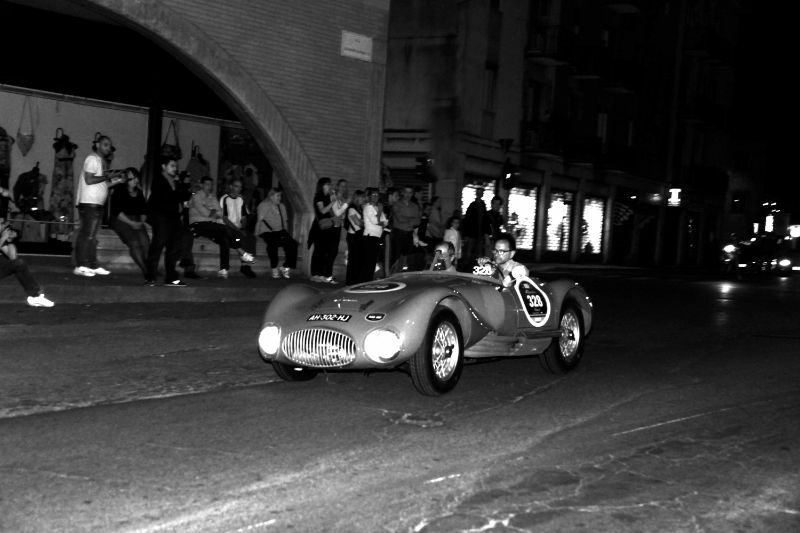 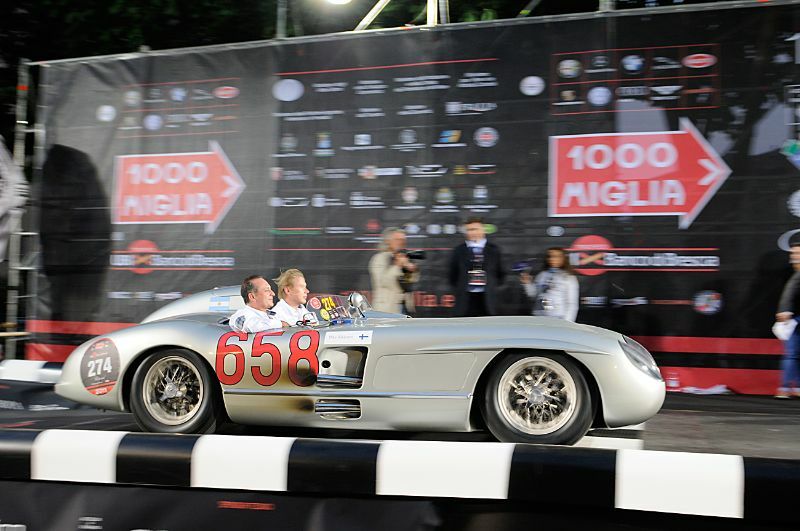 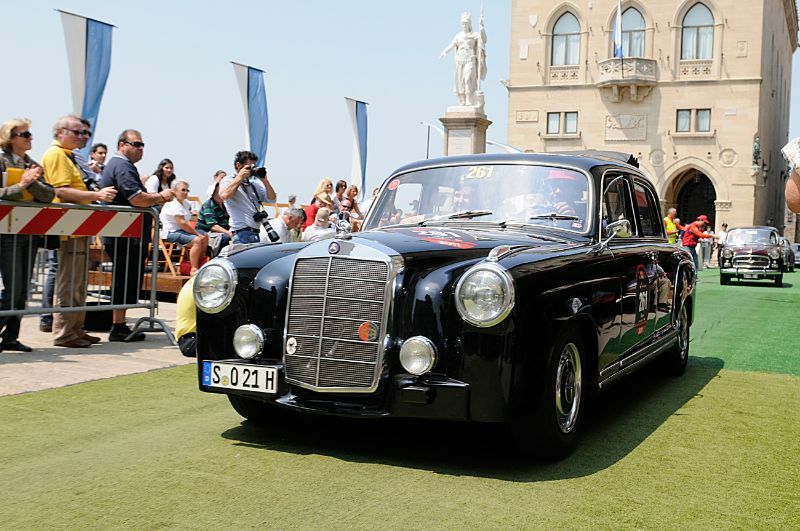 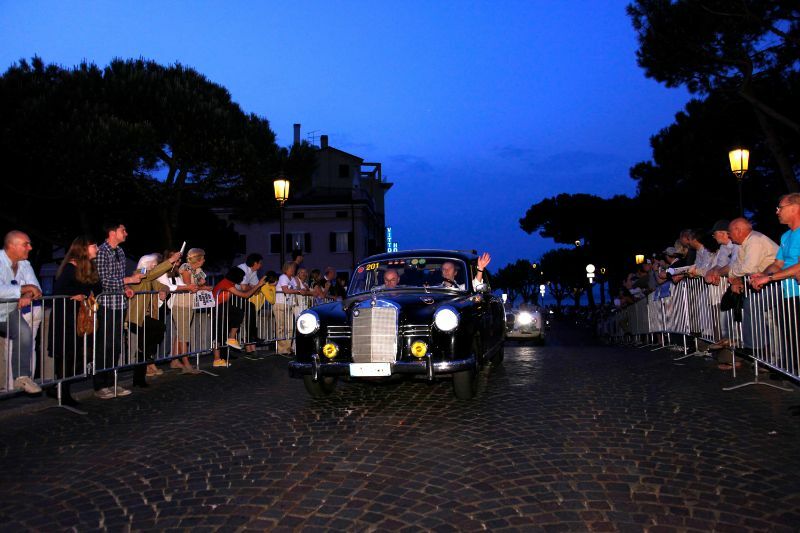 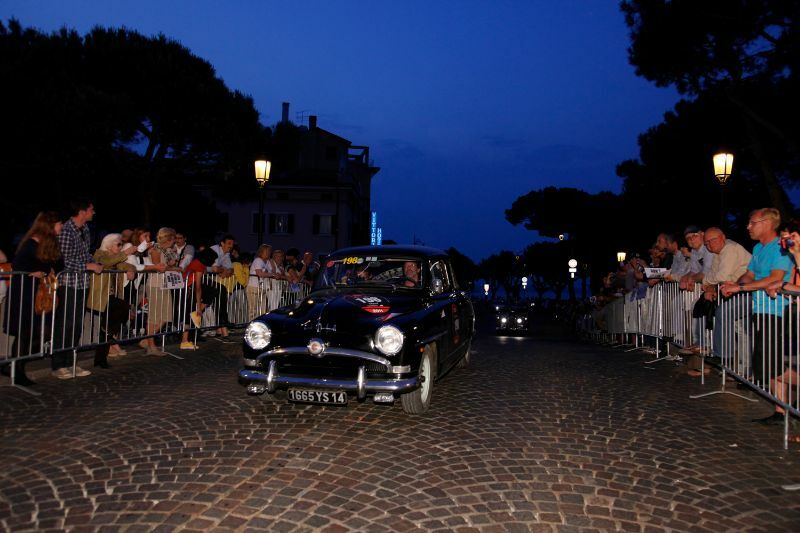 The world’s most famous regularity race saw many new features regarding the route, as Mille Miglia organizers continued to emphasize the technical aspect making the race more of a sports challenge. 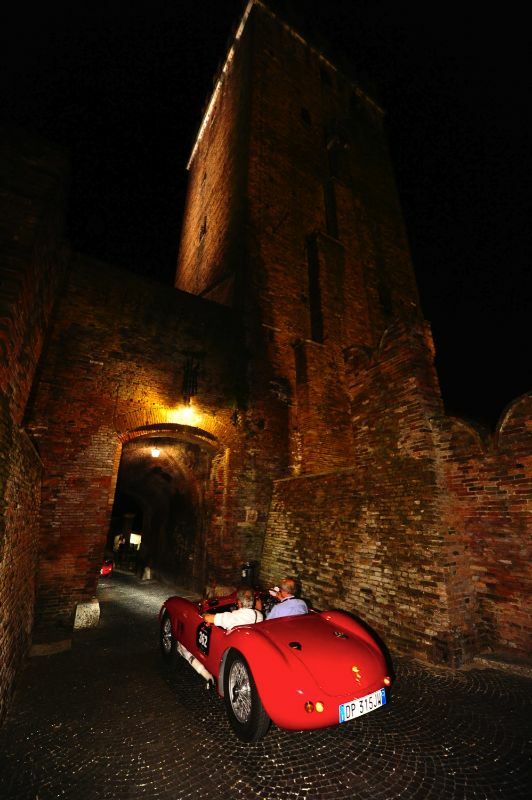 Four new trials were added in the picturesque landscape below the castle, Castello di Sirmione, on Garda Lake. 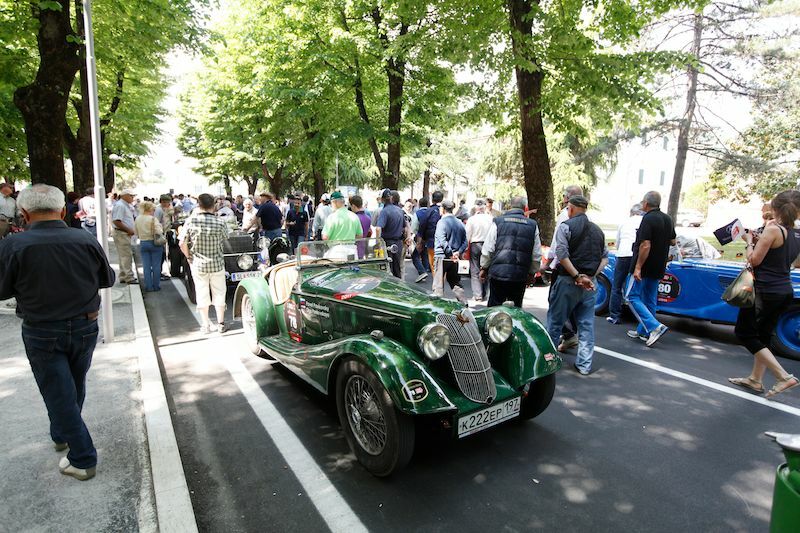 A precision test was held on Monte Carpegna in the Province of Pesaro and Urbino, on a road that is opened only for two special events: the cycling Giro d’Italia and the Mille Miglia. 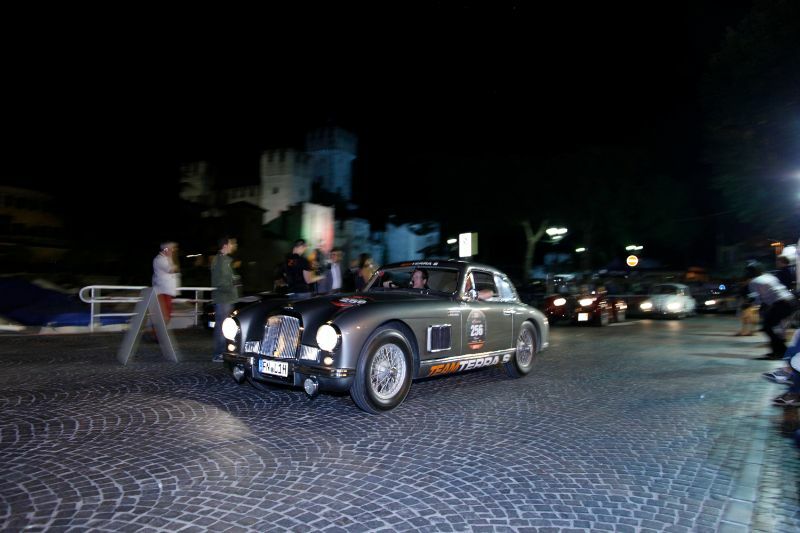 As in previous years, Monte Terminillo awaited the passage of the classic cars in the race, although snow was not found like the previous year. 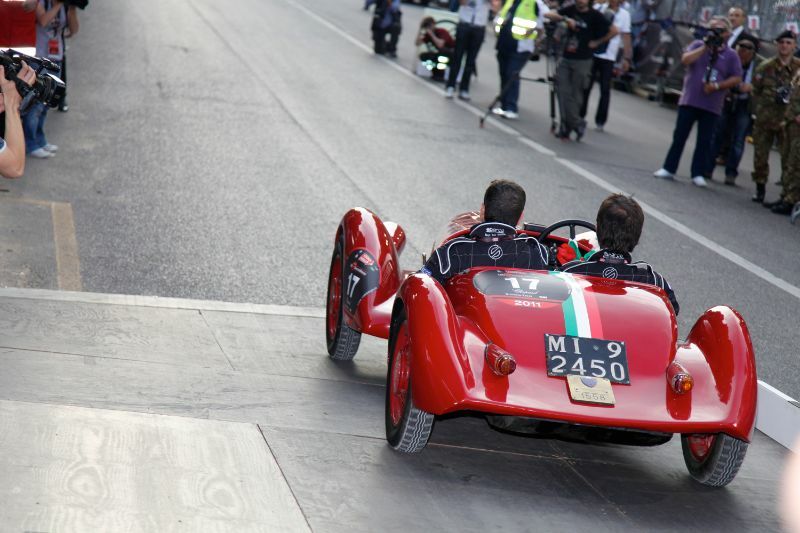 Also new in 2011 was the trial on the Vallelunga Circuit near Rome. 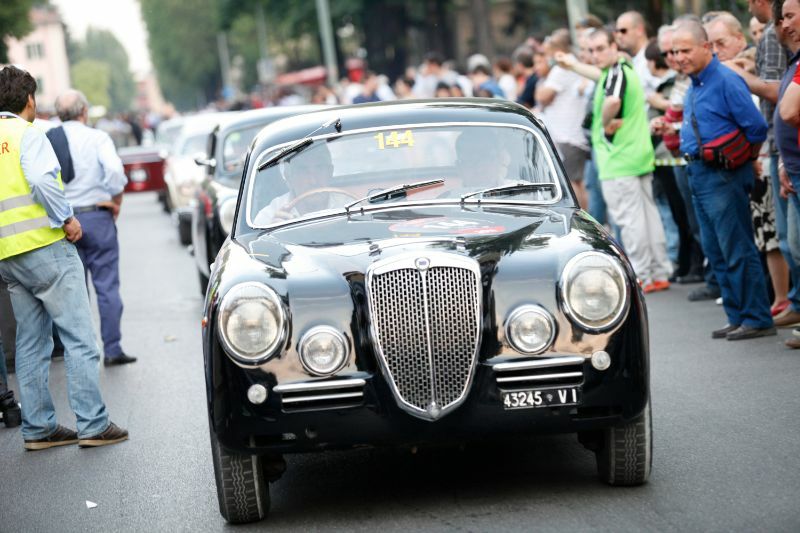 On the way back to Brescia, there was a trail “in the rough” on a dirt road, and the exceptional opening up of the Piazza del Campo in the heart of Siena and the Piazza della Signoria in the heart of Florence for the cars to dash through in the race. 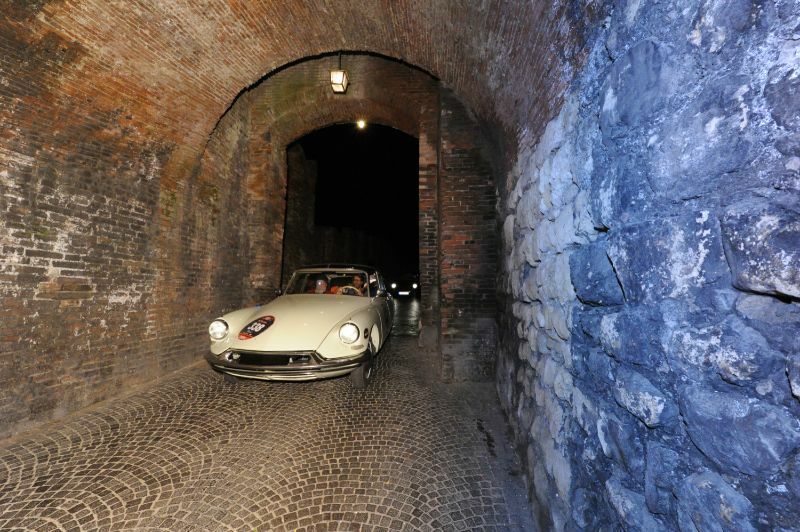 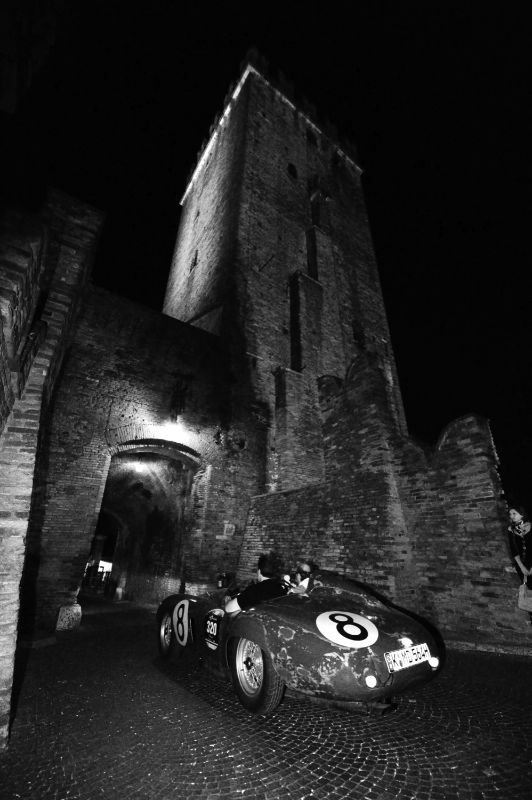 In addition, Mille Miglia participants faced the passage through the Futa Pass, the Raticosa Pass, and the Ferrari Circuit in Fiorano. 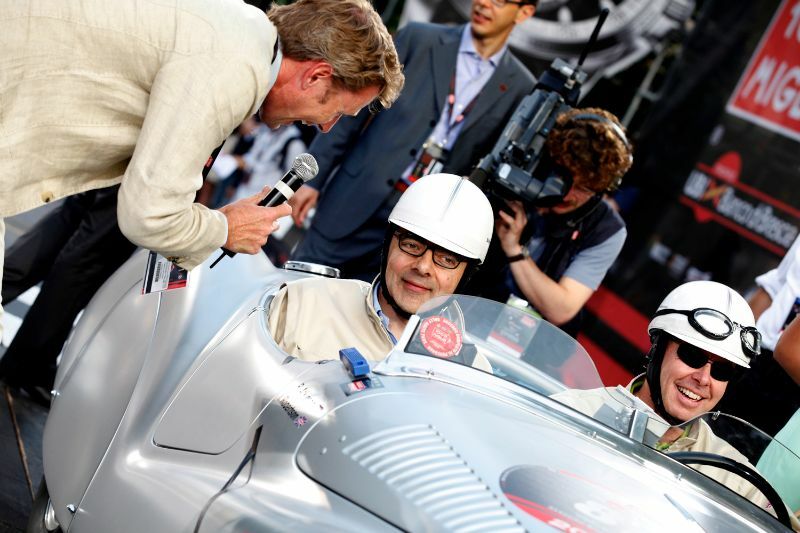 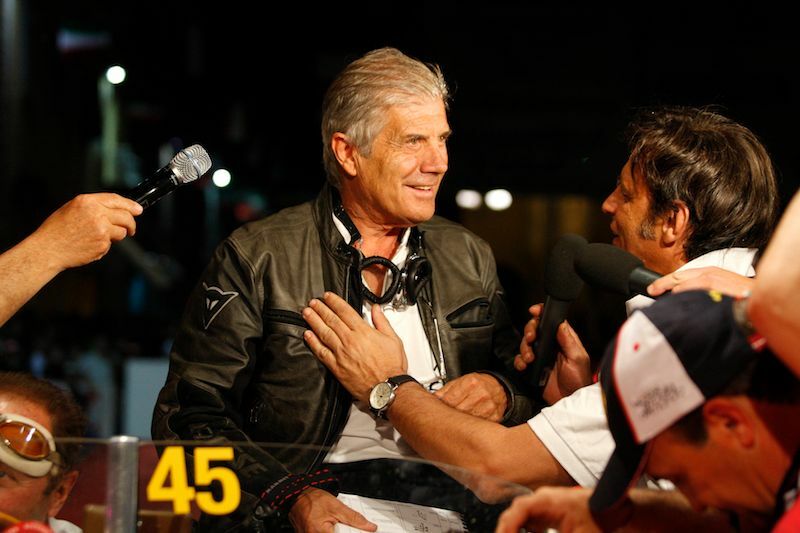 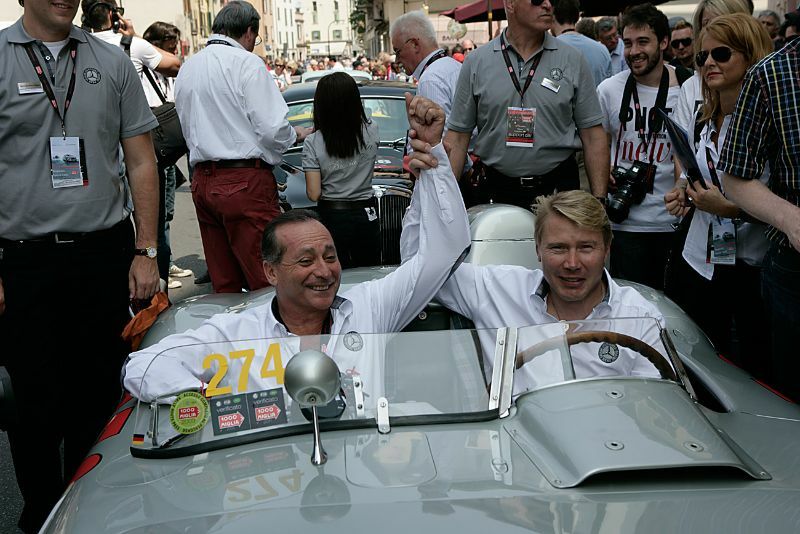 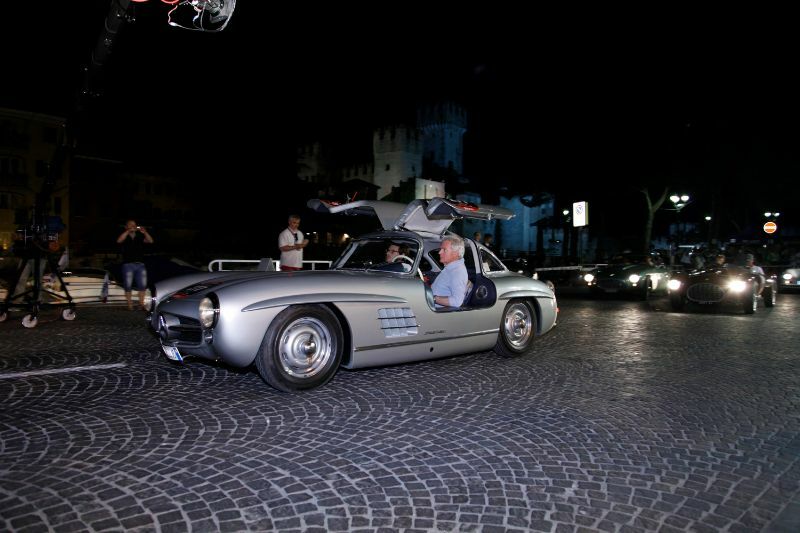 Celebrities and VIPs were aplenty at Mille Miglia 2011, including actor Rowan Atkinson, aka “Mister Bean”, driving a BMW 328 Mille Miglia Roadster; motorcycle champion Giacomo Agostini paired with Jochen Maas in a Mercedes-Benz 710 SS; and Mika Hakkinen and Juan Manuel Fangio II driving a Mercedes-Benz 300SLR. 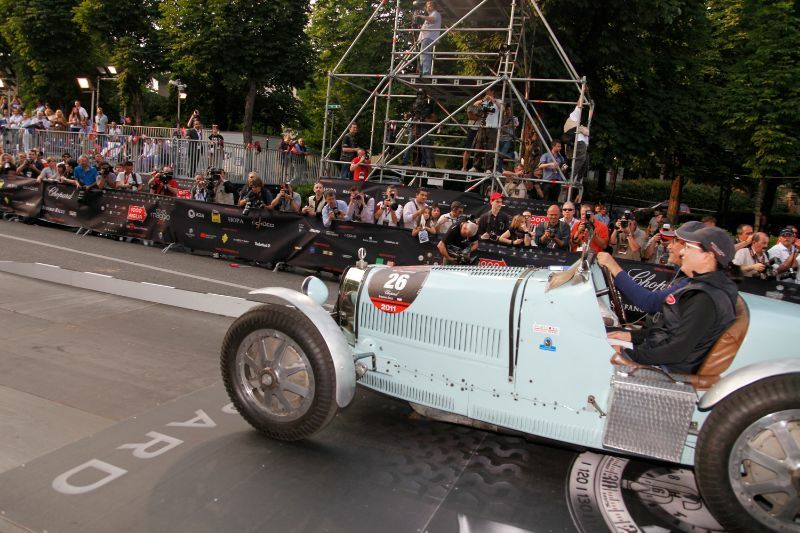 A surprising placement was that of Rowan Atkinson, in his first Mille Miglia, who comfortably remained in the top 100 for the entire Mille Miglia.